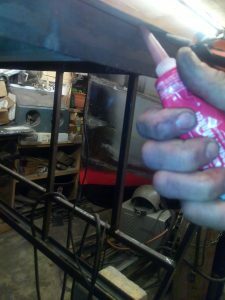 Although there has been 2 weeks since the last installment to the blog, I have actually achieved a fair amount of progress. 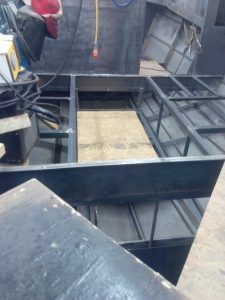 I have since finished the aft battery bay, and cut out the bracing where the hatch will go. 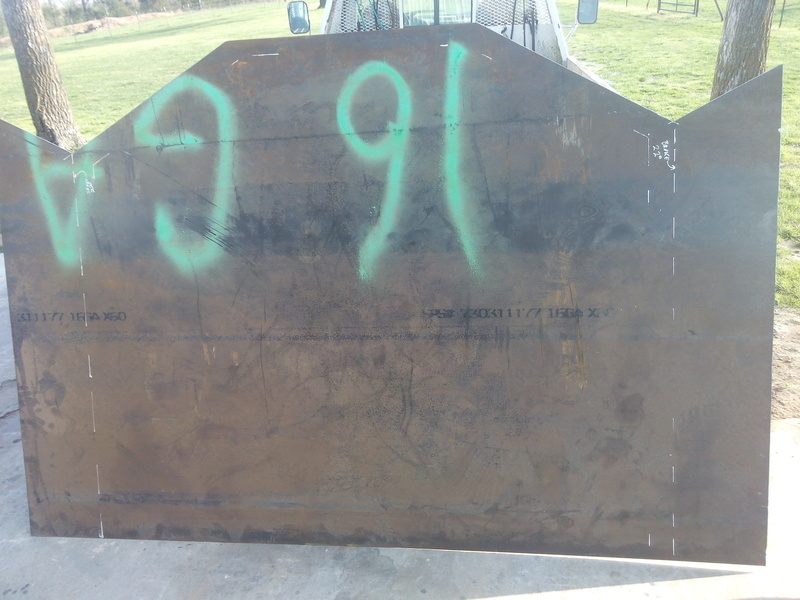 Aft Battery bay, will hold a dozen group 31 AGMs or 4 – Group 4D or 8D batteries. I also finished welding all the outer skinning of the outer, lower 4 feet of the wheelhouse bulkheads. 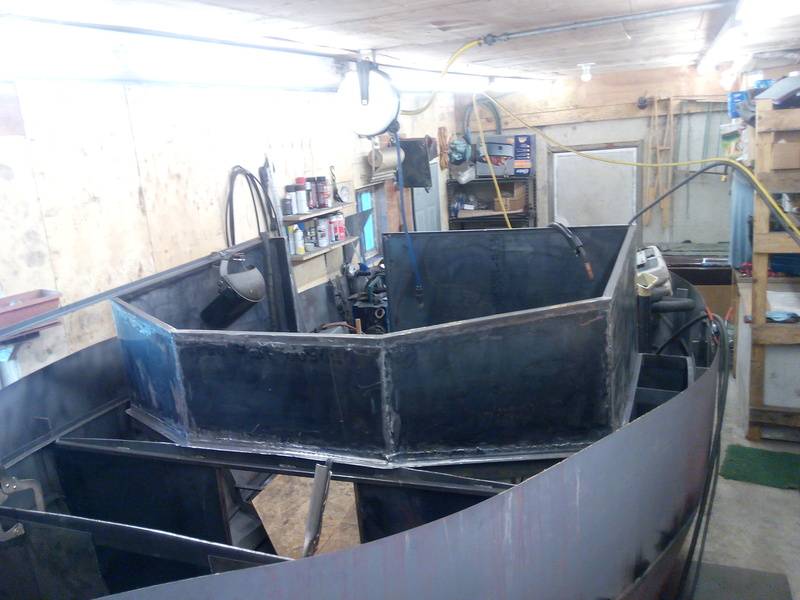 I did continuous welds since the underlying plan is to make this tugboat as water-tight as possible. 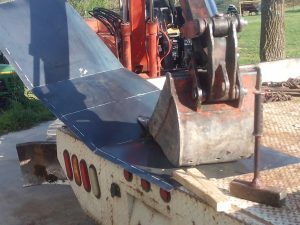 I have seen big houseboats in the salvage yard with the story that, “ It was a perfectly good $250,000 yacht until the bilge pump locked up or the pump battery ran out of juice a day into a 3-day rainstorm.” That kind of heartbreak is just too much. All lower wheelhouse outer skins welded in place. 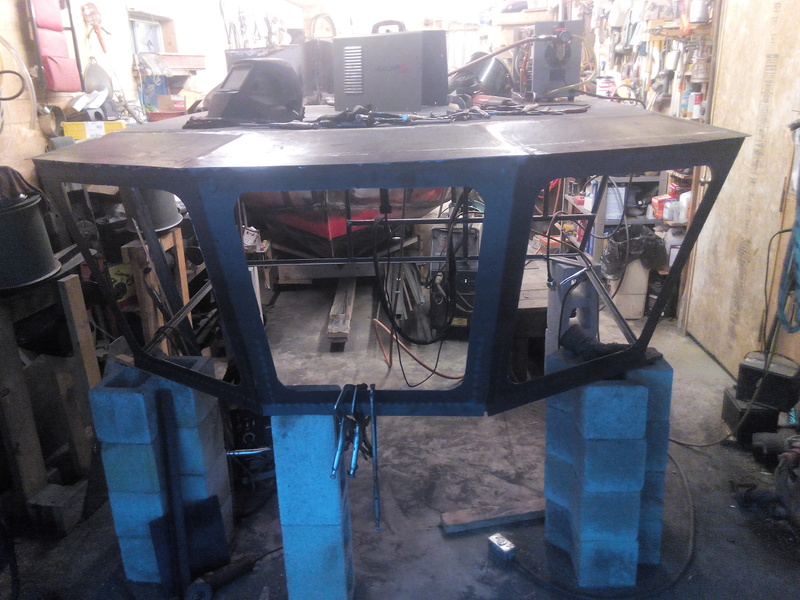 So, at this point, the shell of the lower wheelhouse is done. 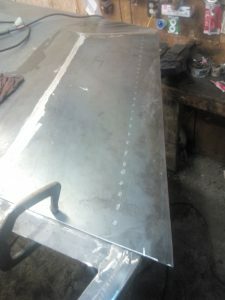 I had a couple days of grinding to smooth up the finish. 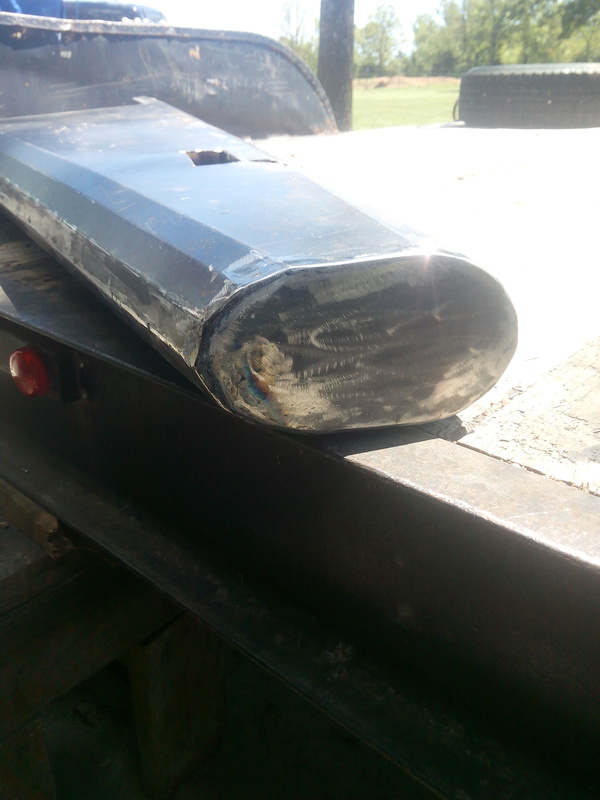 When painted, I wanted it to have a more “monolithic” look with smoothed off welds. 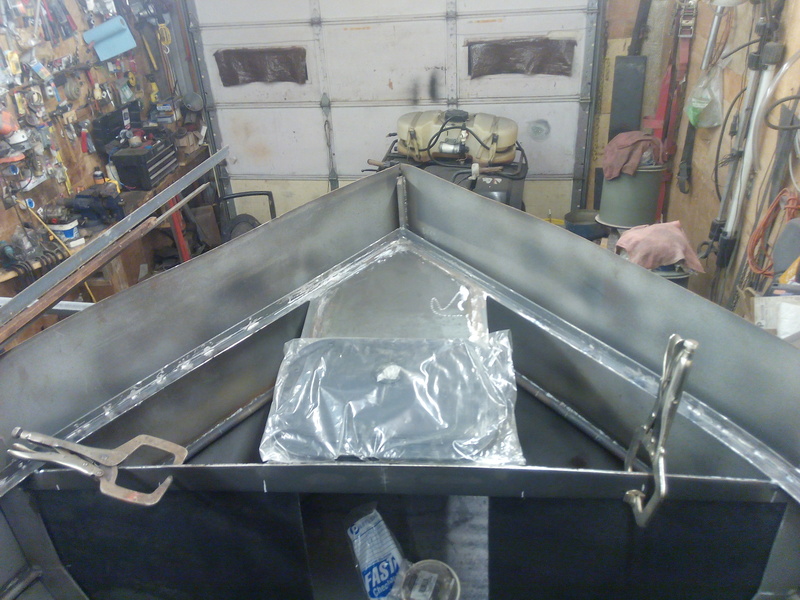 And, I have been working on the hatch lid for the aft battery bank. 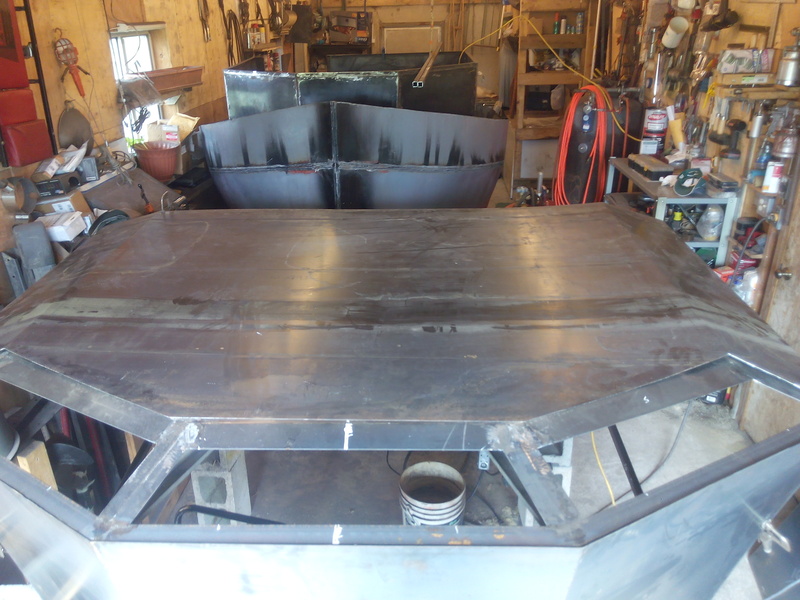 The lid is roughed in, and I will be installing the removable piano hinge next week. Battery bay lid roughed in. 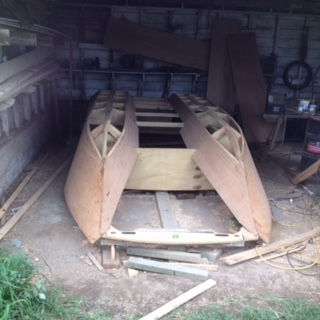 I am still working out how it will all work out in the front bank lid. I have a desire to “keep it simple stupid” (K.I.S.S.) 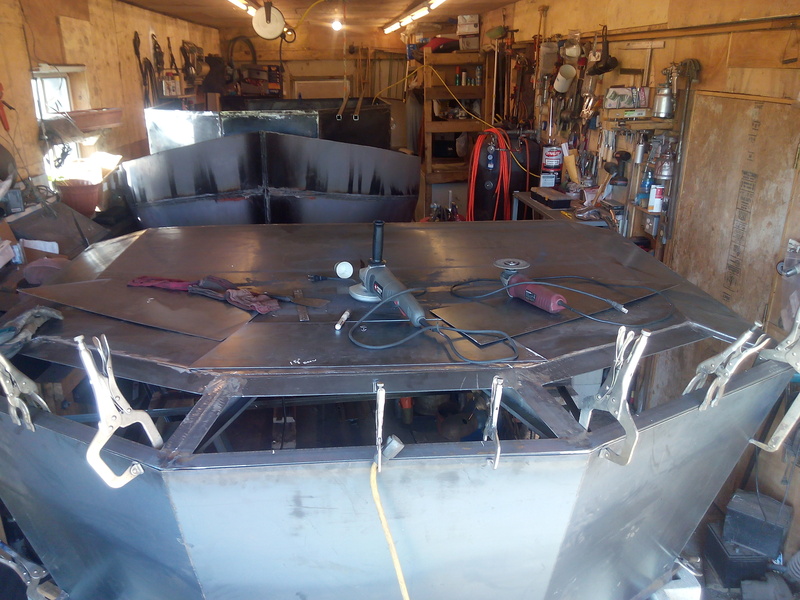 with a single large hatch, but then I would have to add extra reinforcement since the helm station sits smack, dab in the middle of the area above the bay. So I might make a pair of smaller hatches fore and aft of the seat pedestal. 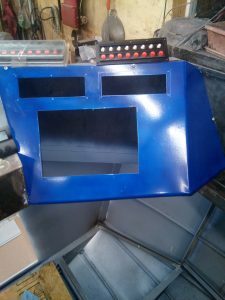 The instrument console is going to be a hoot to draw up and have sheet-metal breakers to make. 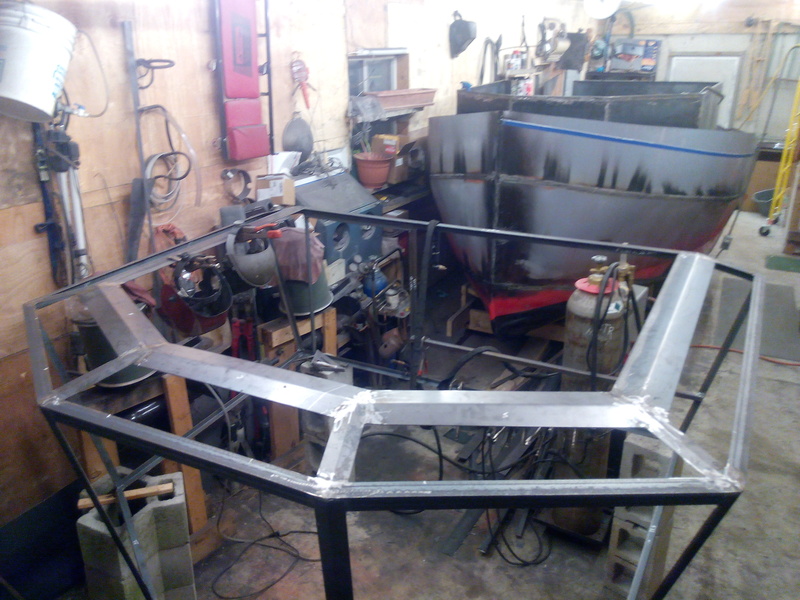 The plan is for it to have a total of 5 facets, and be sorta “wrap-around”. 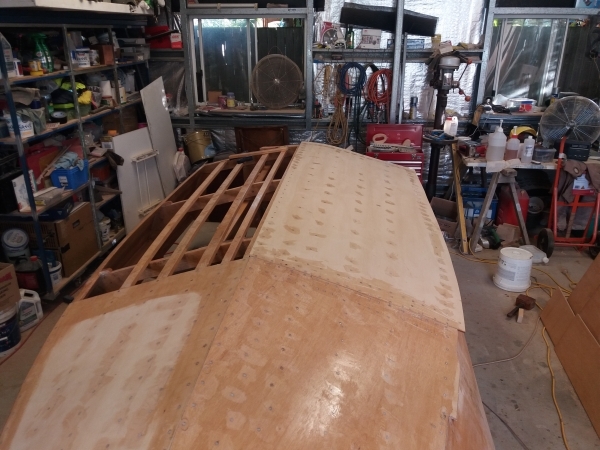 And then there is the foredeck to finish too. 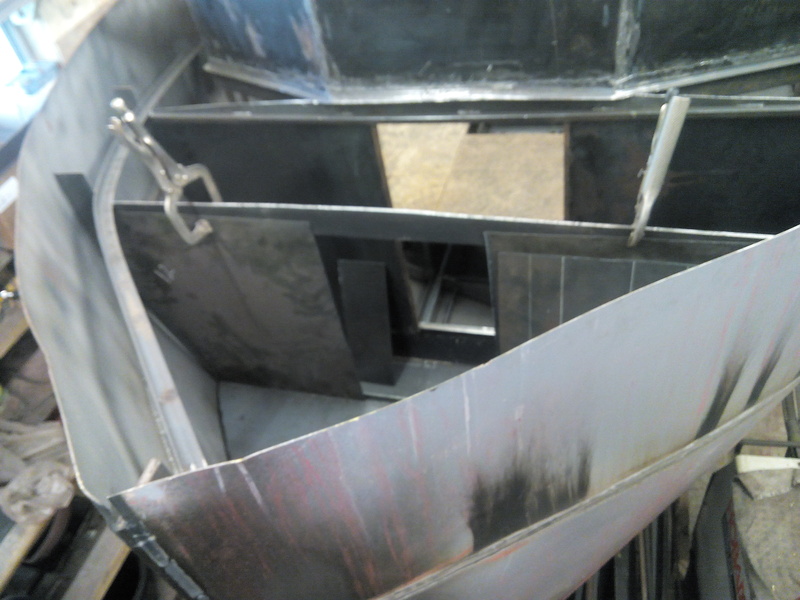 I still have not constructed the rope locker deck hatch, nor the forward bit to use for lashing off the bow. Happy March fellow builders! Sorry it has been so long since an update, but I have been busy with some detail work as well as the farm. I finished the aft battery hatch installation with the drilling and tapping of the holes to mount the hinge and lid. 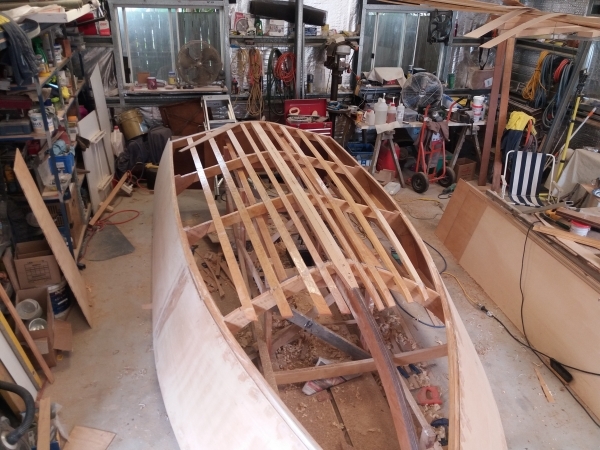 I know I could have just oversized the holes and added nuts to the attachment, but I am just OCD enough, to think I did not want to be out on the water, in a storm, at night, on a Saturday evening, (enough environmental problems yet? ), and be fumbling around in the bilges for the loose nuts and washers I lost. So, I just tapped them out. I spot-welded the piano hinge on the tops, and stitch-welded the bottom so It would hold very secure without deforming over time. 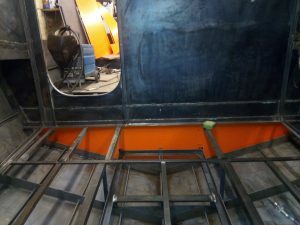 I also finished the same process on the front door in the wheelhouse, that gives access to the generator room just in front, under the foredeck. 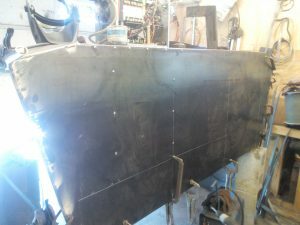 I also finished shaping, drilling and mounting the aft bulkheads for the bow rope locker, and the generator room door. 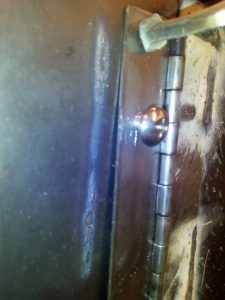 I also took the time to make a hard point in front of the rope locker access for the forward bit, .. bow bollard, …? 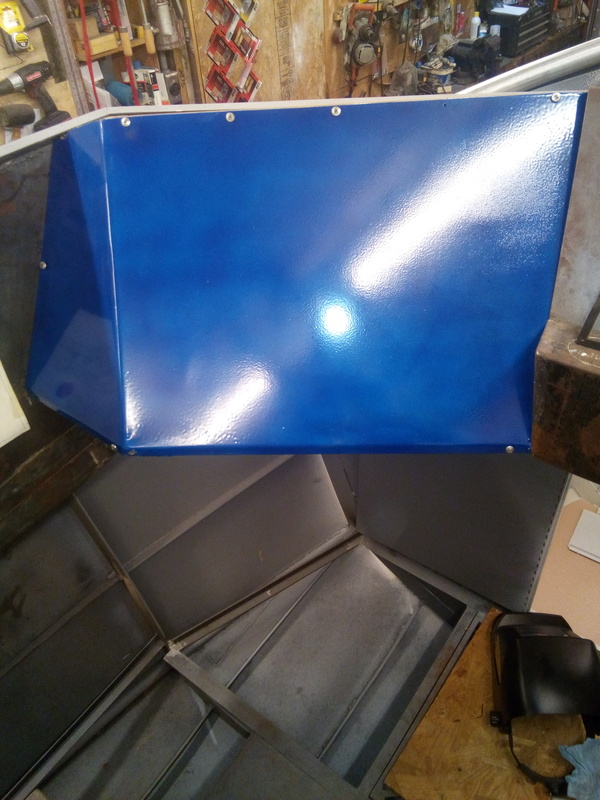 Here are a couple pictures of the completed forward battery pull-out hatch covers, and the plate I cut and laid in for the captain’s chair(s). I still have not decided if there will be one or two. But there will be room either way. I finally got the steering motors and started constructing the box that would hold them and keep them in alignment under torque. 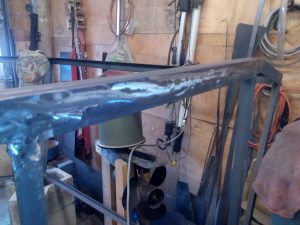 Then I moved over to work on the as yet, unfinished bulwarks and gunnels… First duty was to start shaping the top rail, to see if my idea was going to pan out in my humble little shop. 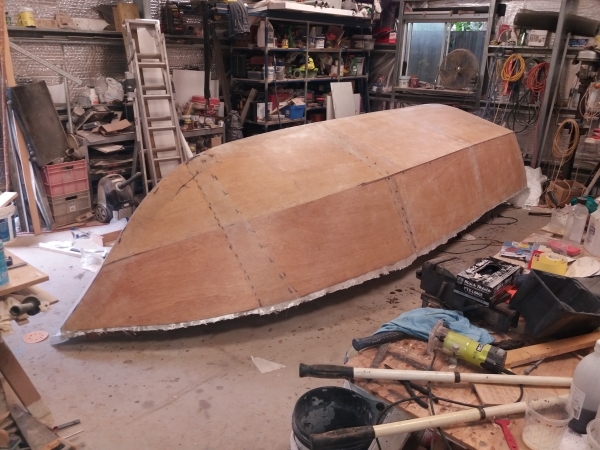 The idea is to take some oval tube, 1 1/2” X 2 1/2”, and roll-curve it to fit the top of the outer hull skin. 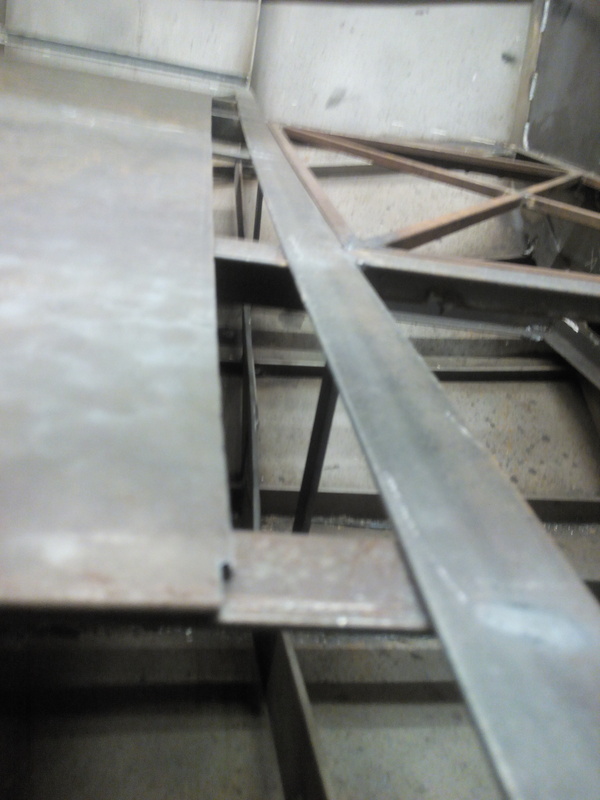 Then weld it to the tops of the frames and then back-stitch the skin to the rail, … in theory. So, I took a manageable 10 foot length and started the rolling process. 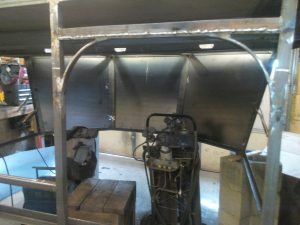 And here is a picture of that process started. 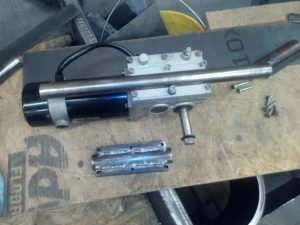 The little, light HFT hand roller proved to be just a bit too light to finish the process, … this year. 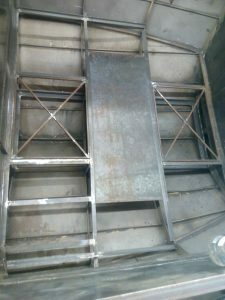 So I contacted my friend Mark at Volenweider’s metals, and he was willing to finish the job I started. At this point, this segment of work was all done up to the 11th of March. 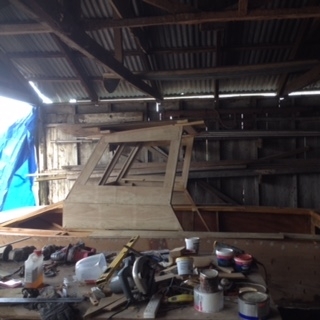 Then I moved on to the upper structure of the wheelhouse. The following few pictures are of that as it developed. 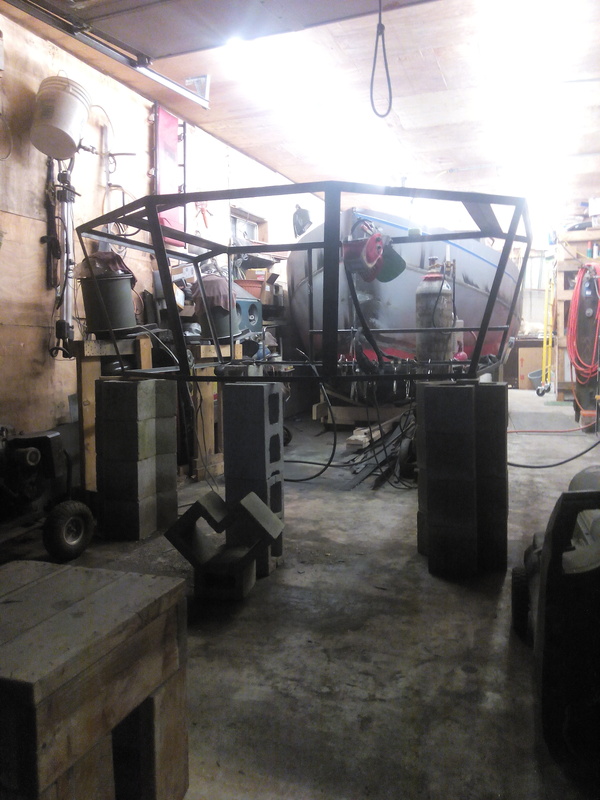 Remember, I made a mating frame to the lower section, and then moved it to blocks in front of the hull construction. 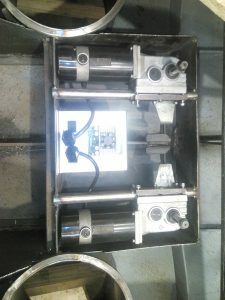 I had to return the first motor controller to Dimension Engineering as the final steering motors I was able to get, that I think will work, is a pair of Pride Jet 3 wheelchair motors. My hat is off and great kudos to the folks there. 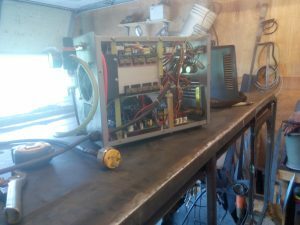 They agreed that since I had not installed or tested the first twin-12 amp controller, they would let me return it for an upgraded twin 60 amp controller to drive the 50 amp motors. Actually, I think they are about 35 amp, but the circuit breaker with the motors is 50 amps. 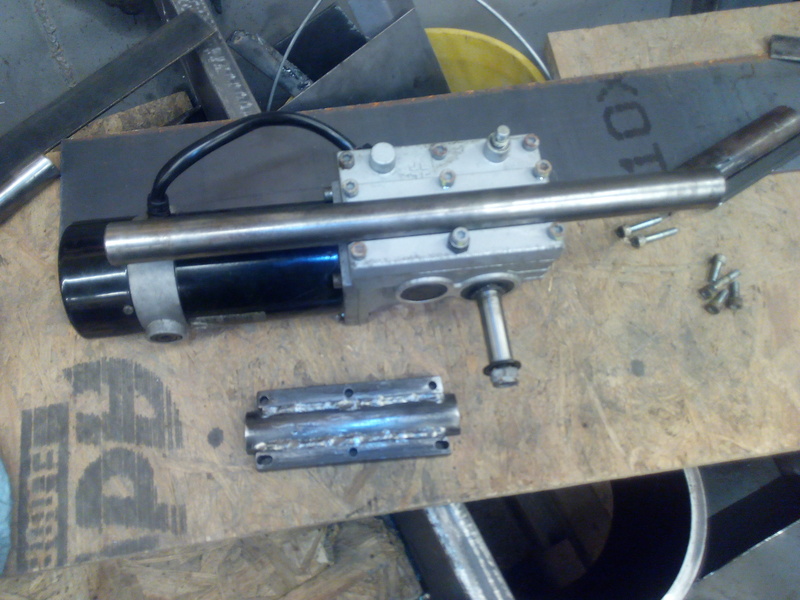 And finally, on Saturday evening, I made the steering motor controller mounting bracket. I may redo it in thicker aluminum, and add a small water jacket, if I see that it is making too much heat. 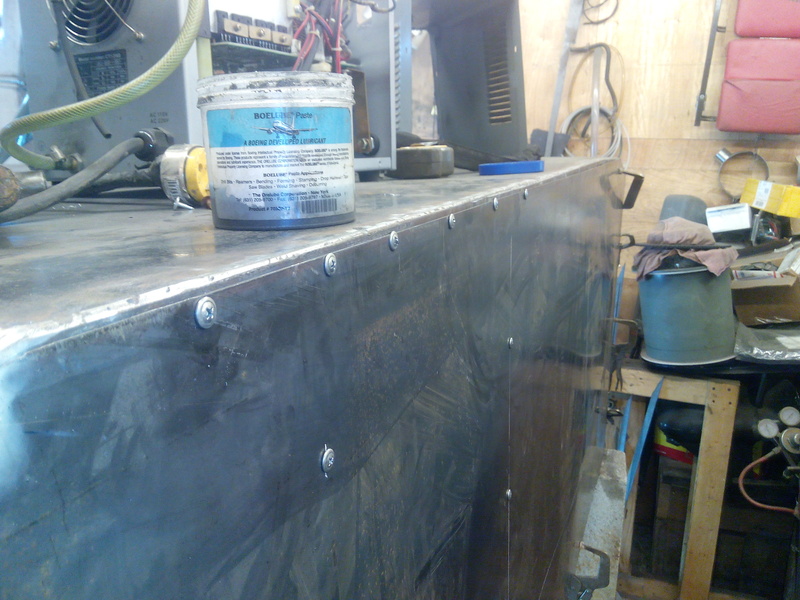 I can feed the water from the chine cooler that is now only going to be used for the main drive motor controllers. Note: I had to shorten the engagement handles so they would not interfere with each other in the box. 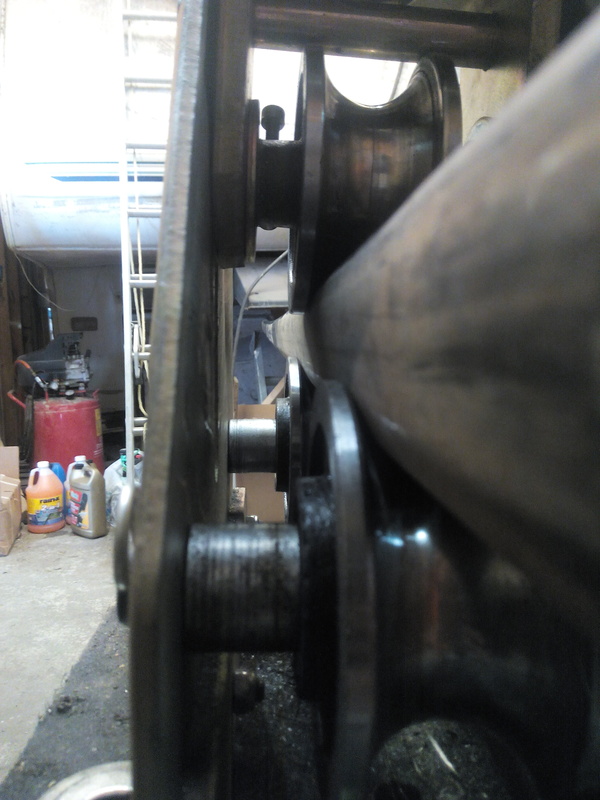 Also, my reasoning for keeping the steering motors on shafts like the original mounting, is that now I have about 1″ of adjustment for chain slack. I might add, that I returned the new pair of “Prop Guards” that Greg, the President of the company sold me. The box was just opened, but nothing removed nor packaging opened. I have been waiting 3 weeks since he got them back now for a refund, and the response from him is, … shall we say less than cordial. I hope to see my nearly 300 bucks next week. I might add that if you are ever in a similar situation, he charges a sleazy 15% to “restock”. On a lighter note, I found a shop that has, and will again 3D print “plugs”, for the proper sized ducts to make aluminum castings from. Each print is setting me back 2-3 hundred bucks. Ace foundry in KC has estimated the castings to get done for $225 each. The first 3D printings were 1/8” smaller than my props, so I had to get the program edited up 3/8” to account for the printing and casting shrinkage. And Saturday Morning, I got the pair of large sprockets for the Drive motor heads. They will get the centers removed, and re-drilled for mounting over the drives. 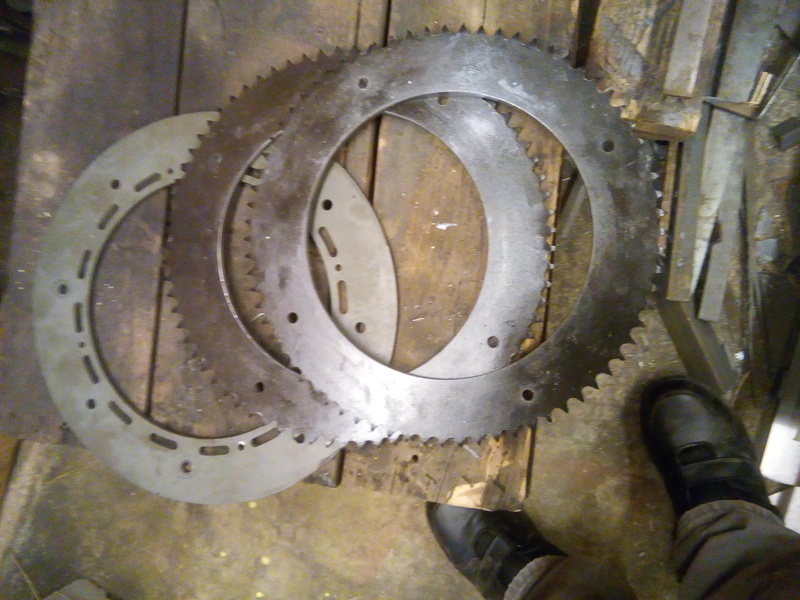 OK, so as of this last Saturday the 22nd, I was able to get the large sprockets machined out. Turret sprockets cut & drilled. 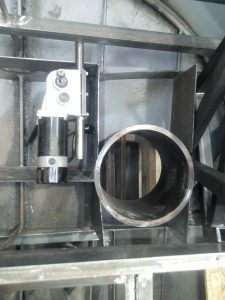 This makes the drive system about 85% completed. 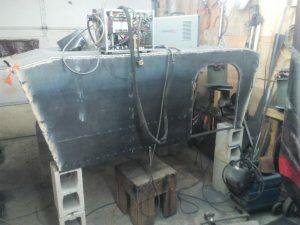 The other 15% will consist of final installation, adjustment, and wiring of all the electronic parts to make it all work. 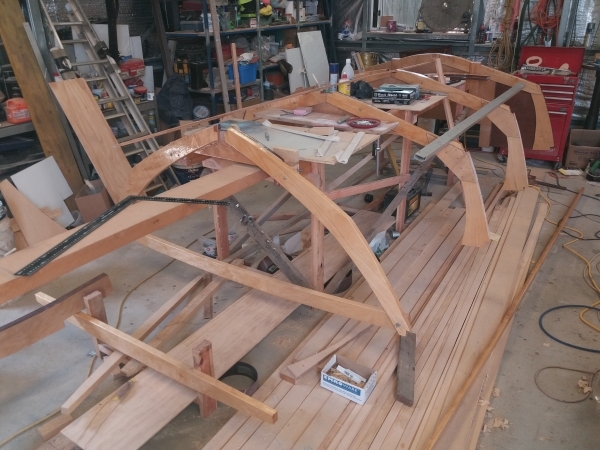 In the field of Homebuilt Aircraft, they would call this 50% done, with 50% to go. 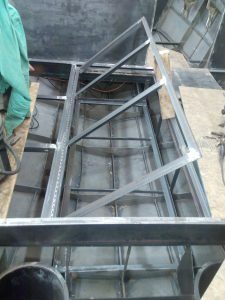 The fitting and wiring is always taking several times longer than initial fabrication. 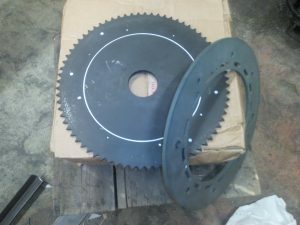 The centers of the large sprockets had to be removed so they could fit over the motors in the top of the drives. Also, the machinist drilled additional holes for mounting them. 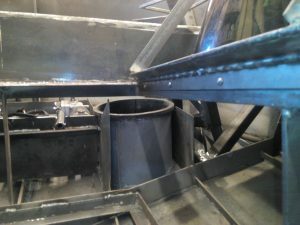 I still have to cut relief slots to clear the terminals on the sides of the motors, as well as make sturdy standoffs to mount them on top of the upper turret rings. 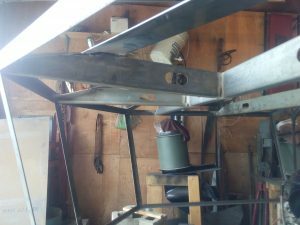 I installed some more bracing for the transverse upper bunk so it could hang well supported on the aft bulkhead, and spreader bars for frame-out of possible windows If I can get them the right size. 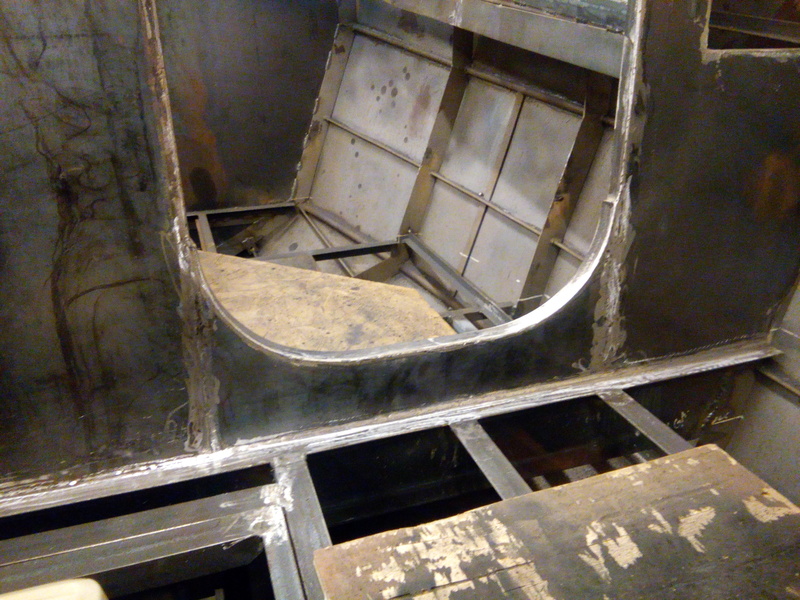 Out-of-sequence shot of aft bulkhead bracing. I had an idea of what I wanted for the ceiling of the wheelhouse. 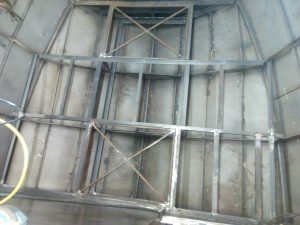 So, I spent a full day in front of my computer and my AutoCAD LT program, designing this cool looking truss joist I wanted to have water jetted and flanges broke. There would be 2, with one being a couple inches shorter than the other. I got the bid, and it floored me. It was going to be several hundred bucks to have just 2 TJs, (truss/joists) made. I began looking at alternatives. 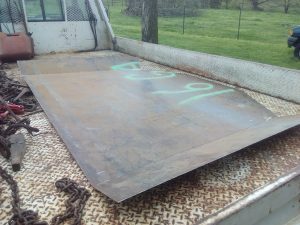 I stumbled upon a fellow in Rogers, AR, that sold commercial grade, structural steel studs (A&D Supply). 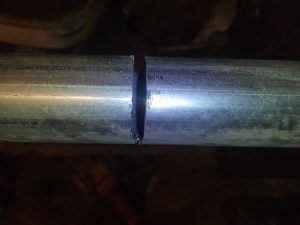 The thickest ones he had were 16 Gauge. 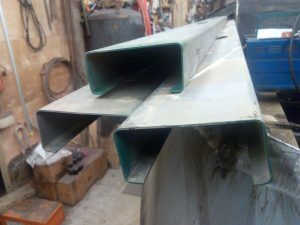 I deduced these would be the right thickness, they had lightening holes for utilities, and beautifully rolled flanges. I was pleased to discover the cost for 6 of them, (yes, I knew this was more than twice too many), were only $63 and change with tax. That came to about $10.31 each! After plotting and cutting, I found I needed parts of a 3rd, to finish out the forward area ahead of the forward TJ. 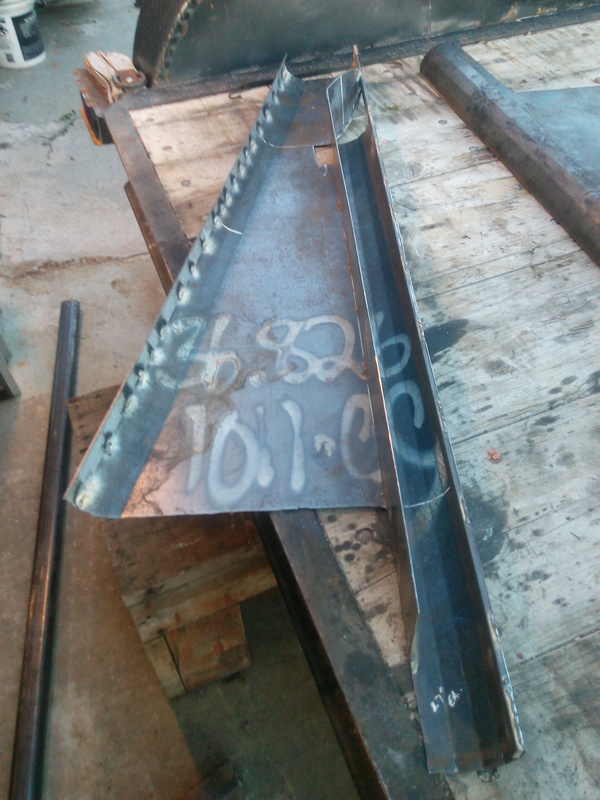 1 5/8″ X 3 1/2″ X 16 Ga. steel studs. 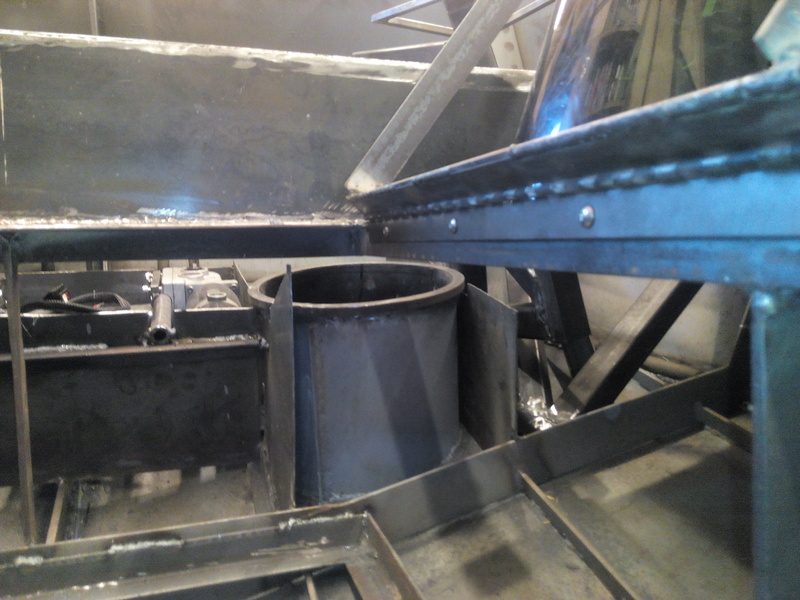 I welded in the TJ pieces, including the forward 2 angle braces for the facets of the front of the wheelhouse. Did I mention I had to move and reinstall the door header twice? Yup, that is what I get for building from my imagination. 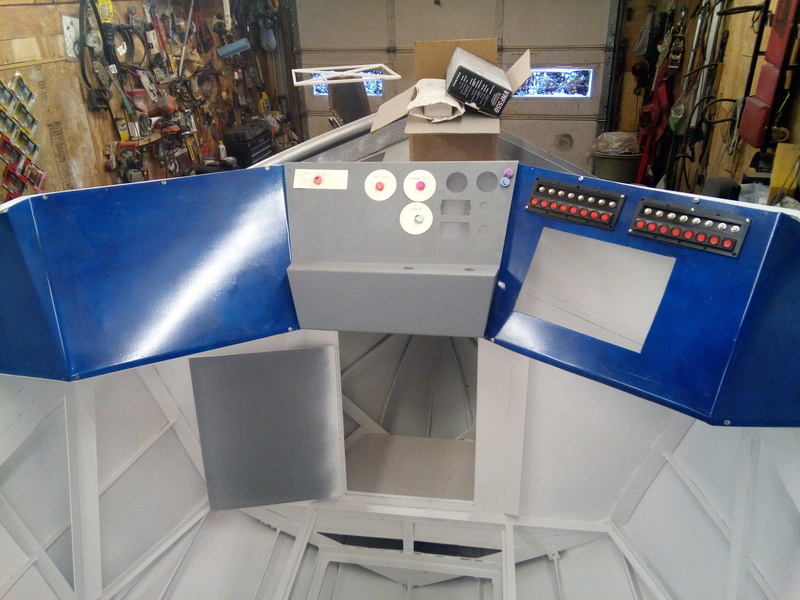 Actually, I will be drawing plans for this wheelhouse option from my build if anybody really likes it that much. 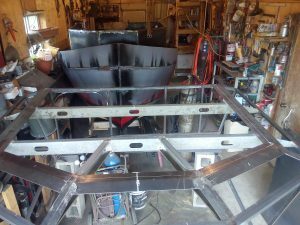 And for the record, if there is anything done right in the wheelhouse modification I attribute it to Divine intervention! First revision of the doorway header, marked for second move. And I just noticed I failed to show the raised step-through at the doorway. It is 4″ high, and all corners were formed around 12″ well casing from 1/4 X 1″ flat bar. 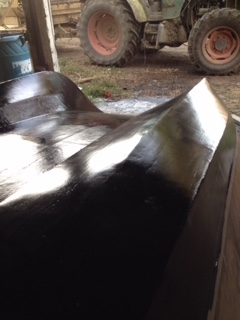 Then came the shimming to height across the TJs to make sure the top skins fit fair. Tj shimming equal to the thickness of the facet corners, 14 Ga. 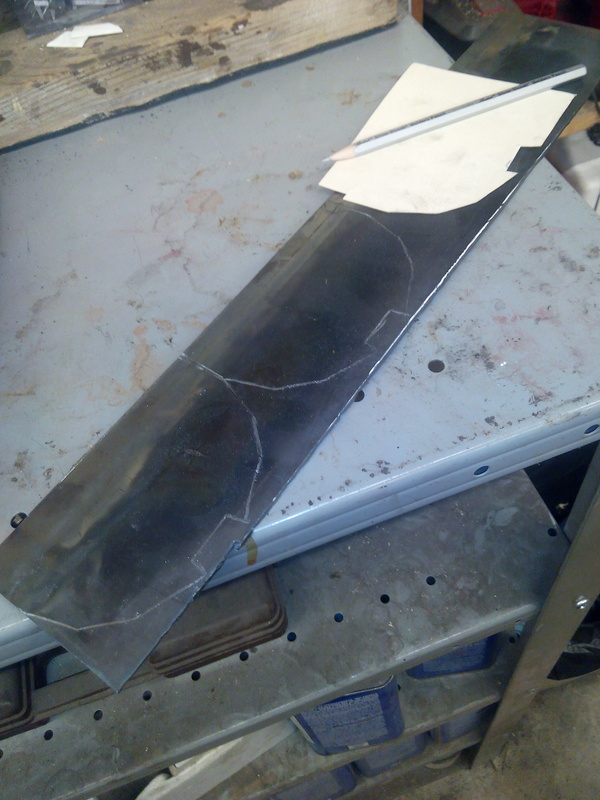 The top skin was a bit to handle by myself, but I cut both it as one skin, and the front 3 facets as one skin. I took them over to Volenweider’s to be broke. The top skin also included the 2 side facets. 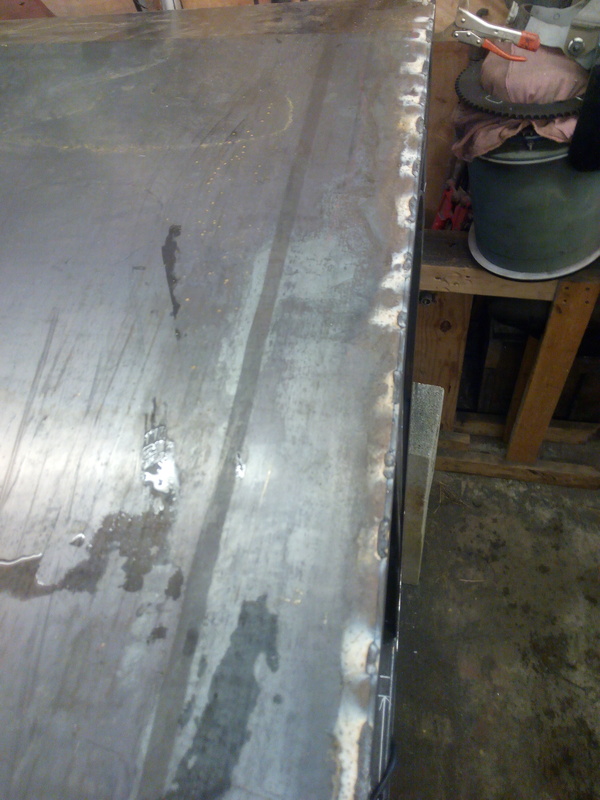 Top and side facet skin cut, ready for braking. Top skin broke & ready to install. front 3 sides plotted, ready to cut out. I might add at this point, I found a couple more useful tools to add to my box. They were a cheap thickness gauge, and an angle gauge from HFT. All combined, were under $20 and well worth it. That is now I have 16, 14, 12, 11 gauge flat stock leaning up to one wall. Yes, I know that one is thicker than another, but I like have the gauge to make sure I have the right stuff in hand for a given task. 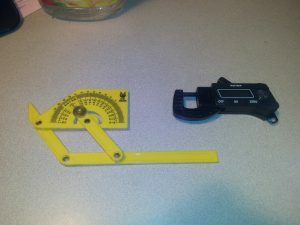 Angle gauge and digital thickness gauge. Hi temp siliconed outer mating flange prior to tacking down. In the case of these 2 skins needing broke, I wanted to give the braker tech an accurate angle to bend to. Since I had one shot at this, and he was in the next town, about 20 miles from me, I did not want to mess it up. So armed with my new tools, I was rewarded with perfect angles to the skins. 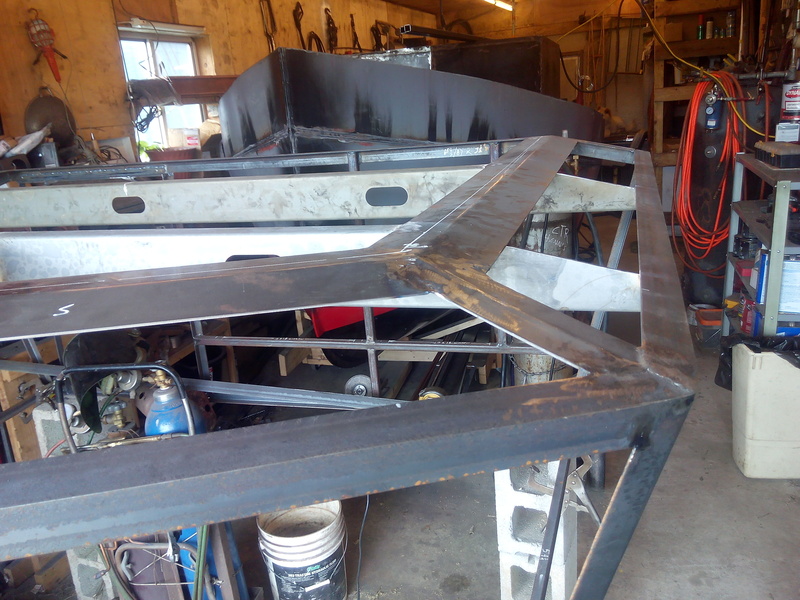 After installing the top skin, I skipped the forward roof facets, so I would have an easier time installing the front skin. 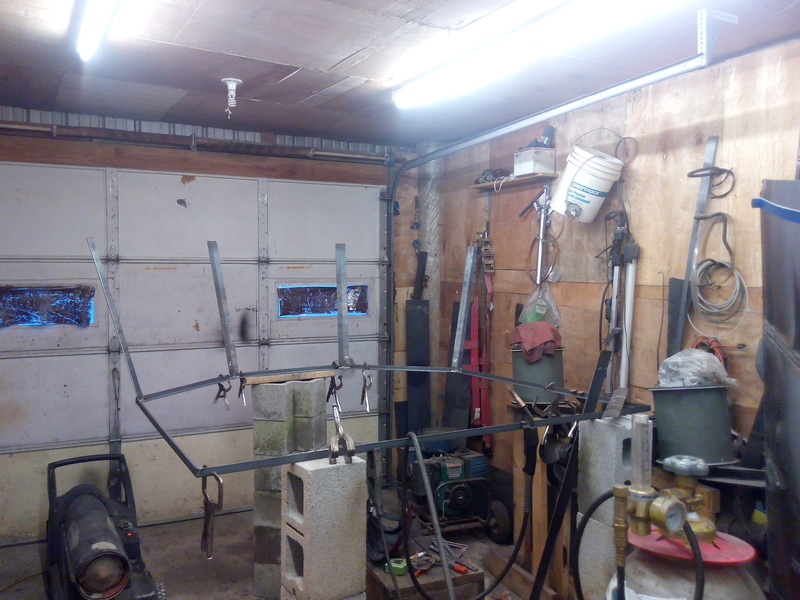 Also, It came to me, that I needed an overhang of different lengths depending on the location. 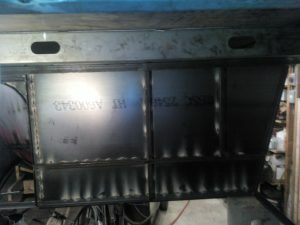 I made a front center panel that has 1 5/8” of overhang. 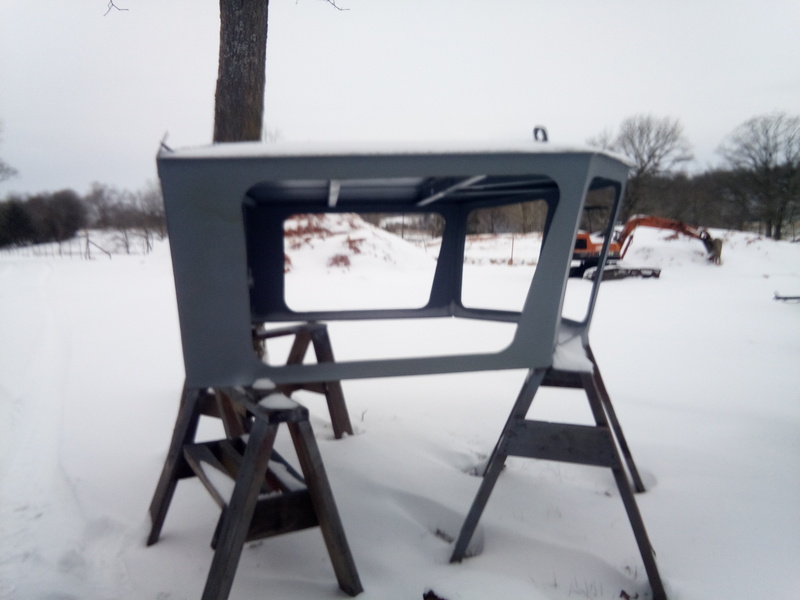 And since the sides have a 3/4” overhang, I made the 2 front quarter panels to vary from 3/4” on the one edge, to 1 5/8”meeting the center panel. This is because the front is more likely to get more running off and didn’t want any on the windshield. On the sides, being not in the thrust line, would have less likely to runoff, and the back getting the most without any concern. 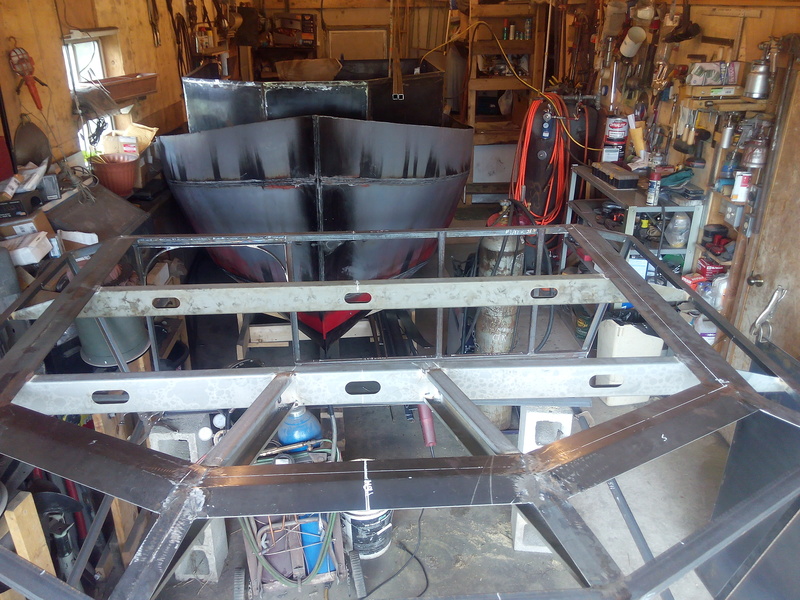 The back glasses will have shedding, but it will have to be added after the mast, stack, and guys are in place. 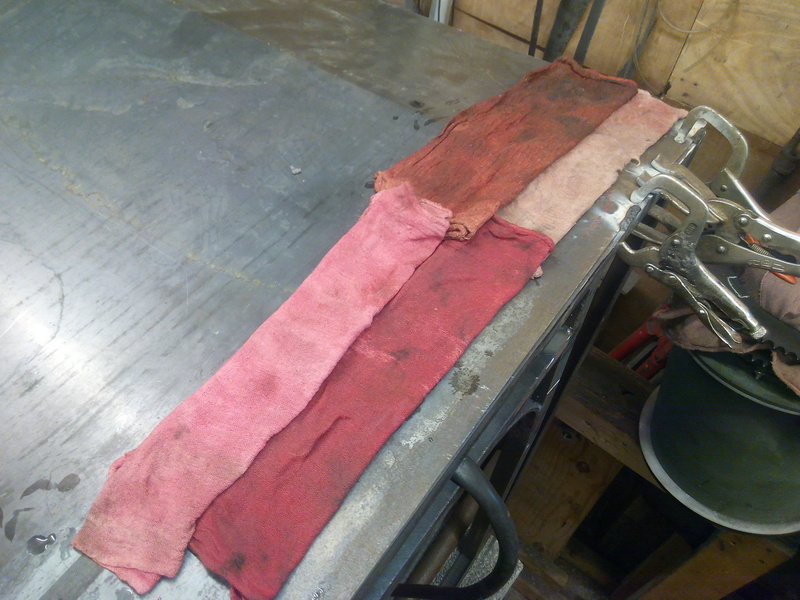 In keeping with my old bodyman experience and in an effort to minimize the warpage, I used lines of wet red shop towels to keep the heat distortion down. 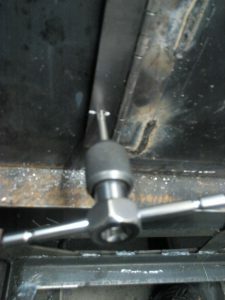 Inside tacks for top side facet attachment. Lots of water on the heat barrier. Stitch pattern of aft skin from the inside. No windows yet. 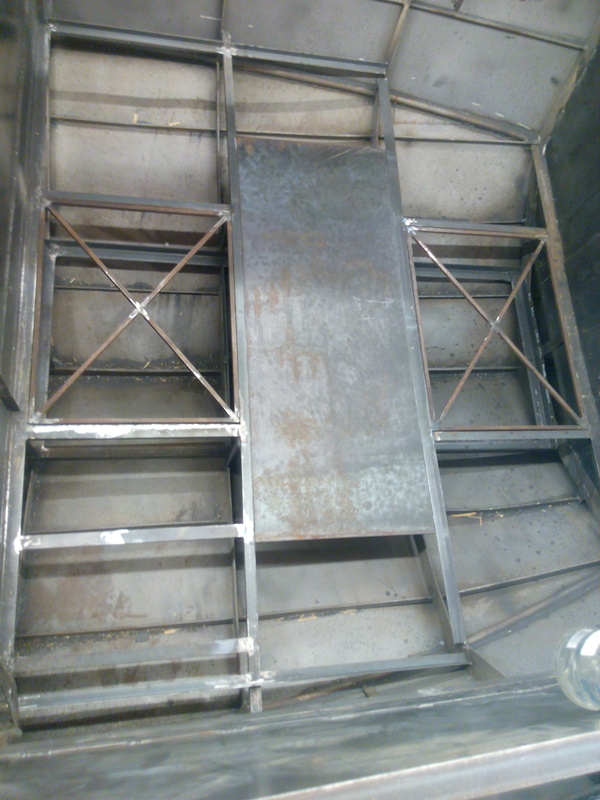 Next was the aft ceiling support. 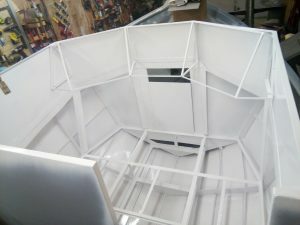 I need something to attach sheet stock to as this wheelhouse is going to have a full 3 1/2” of fiberglass in the roof. 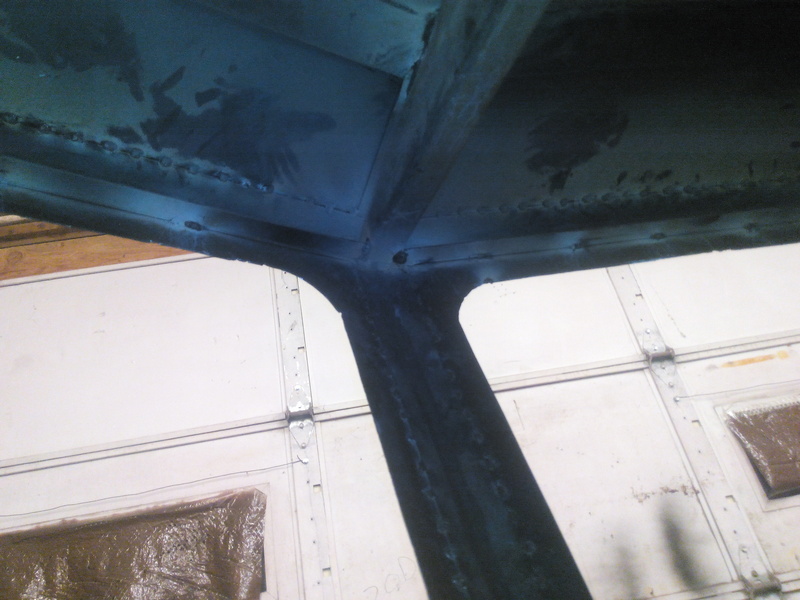 Out of sync picture of aft ceiling support. 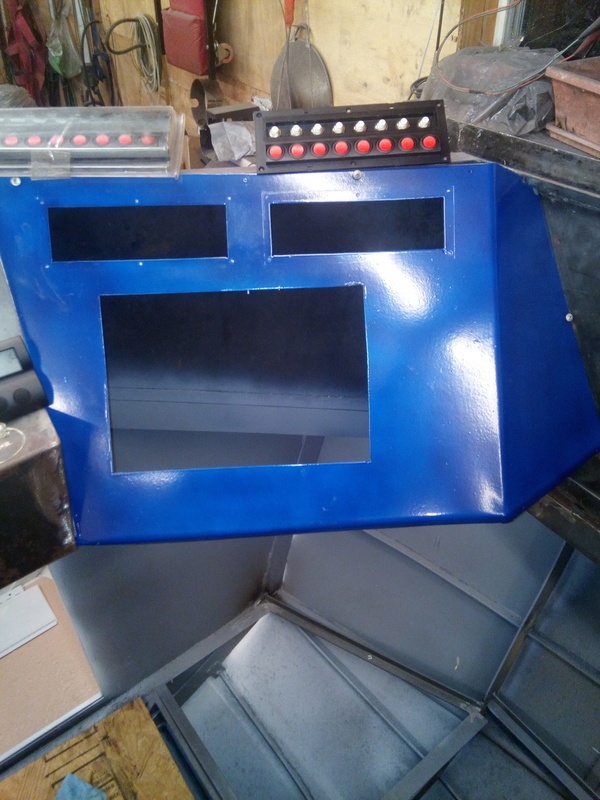 I then installed the 3 front facet panels and smoothed them all down. 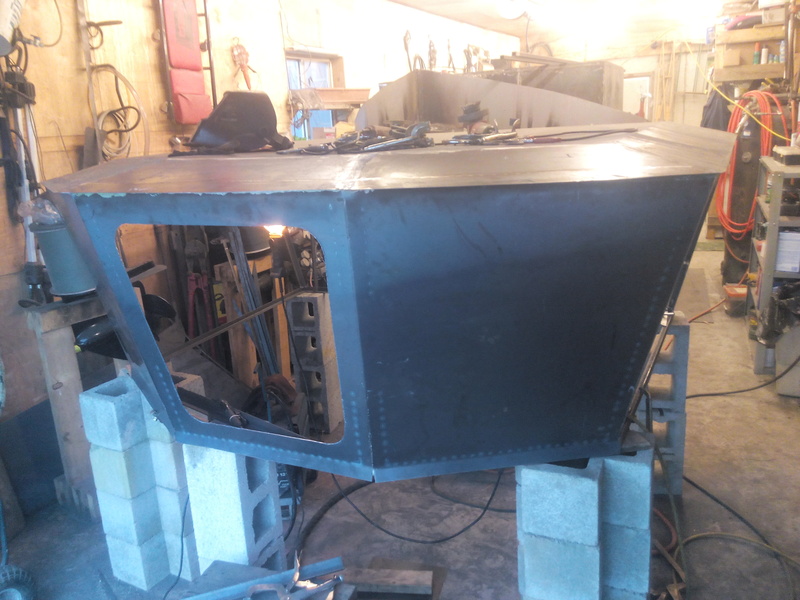 Cutting the window holes was fun… It is starting to look like a modern ASD tug wheelhouse. All 3 front window holes rough-cut. And finally for this installment, I cut and installed the back skin on to the aft bulkhead. There is a lot to discuss here, because except for the top, this skin was the largest one for this portion of the upper wheelhouse. And, to add complexity, it has a doorway and radiused corners. But by evening’s end (midnight), it was all in. In the next few pictures I show how during the natural process, I needed to clamp the skin as it was lifting from the framework. I drilled 1/8” screw holes, and installed self-drilling sheet metal screws to hold the panel in place until it was tack-welded either on the inside framework, or along the edges. 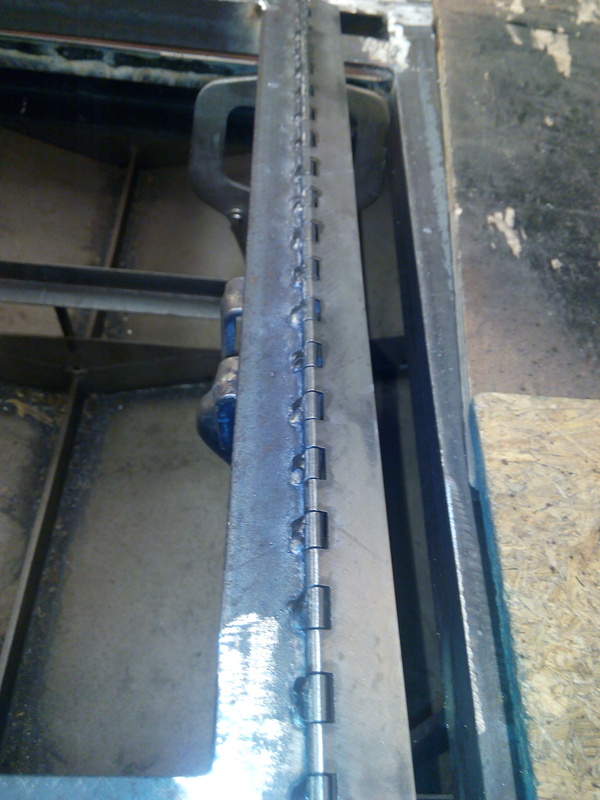 I did not have any pre-determined spacing of the tacks, just estimated given the spans, and position on the sheet. 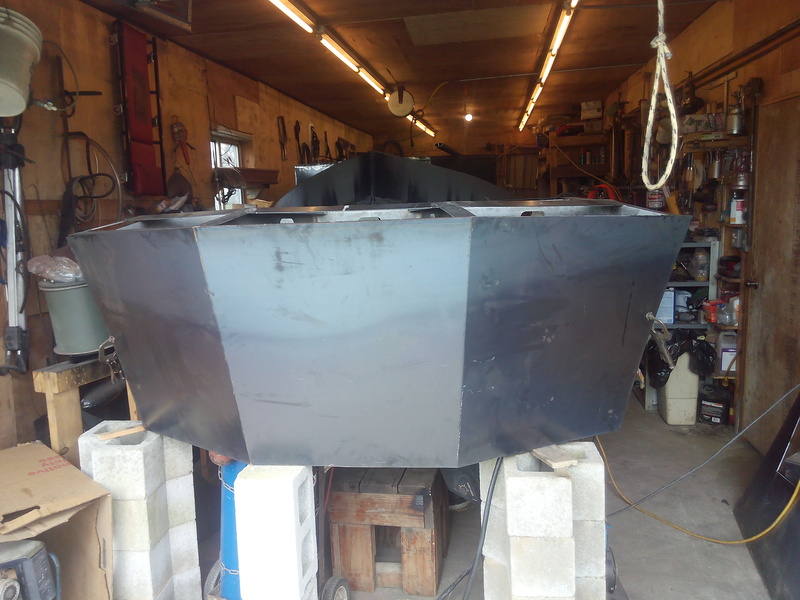 This is not the bottom hull, so the only completely welded area was the outer edge of the top and facets. 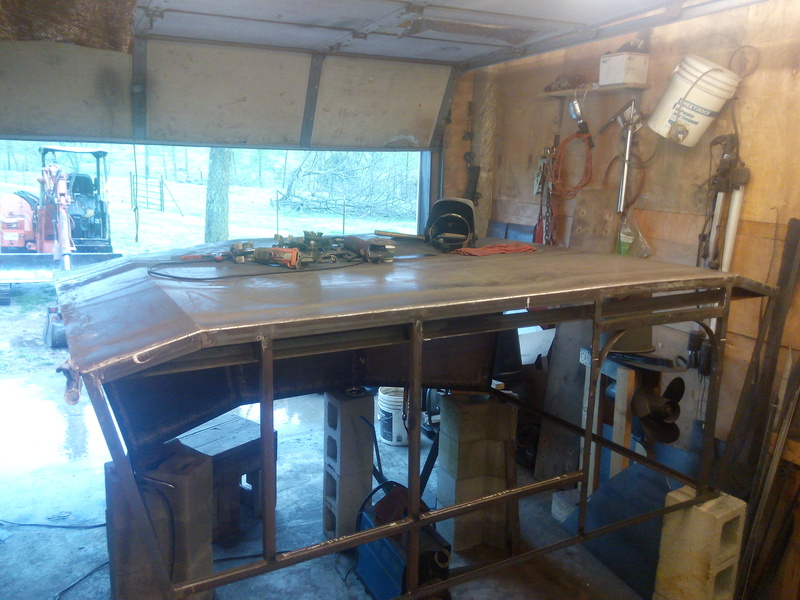 Back is on, doorway cut out & welded. And as is my fortune on several jobs like this one, I had an equipment failure. The main switch fried on the plaz, prior to me getting all the fore and aft skins cut out. So in retaliation I removed the cover, and hotwired the circuit on, and just used the plug as the switch until the replacement arrives in a week or so. Not proud of it, but I had to hotwire the plaz to finish. 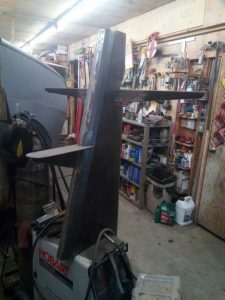 So it is off to the woods to pick more money off my money tree, and get one more 10’ skin to cut sides out of. Here is a shot of the inside rear bulkhead tacked down and edges all done. I moved to the inside and ceiling. 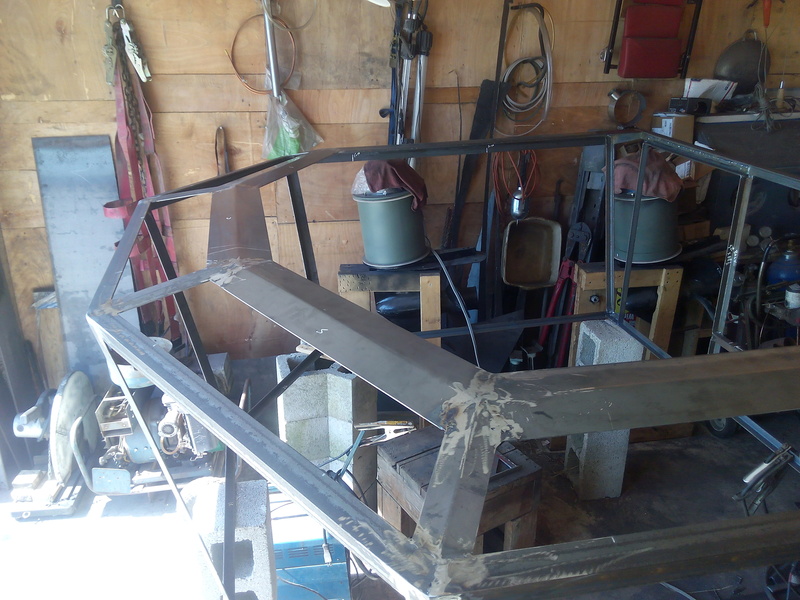 It was given to me to know I needed attachment surface to anchor the outer edge of the ceiling material, so I tacked in some sheared 1” strips of 14 Ga. sheet around the front and sides. Inside upper aft bulkhead welded. 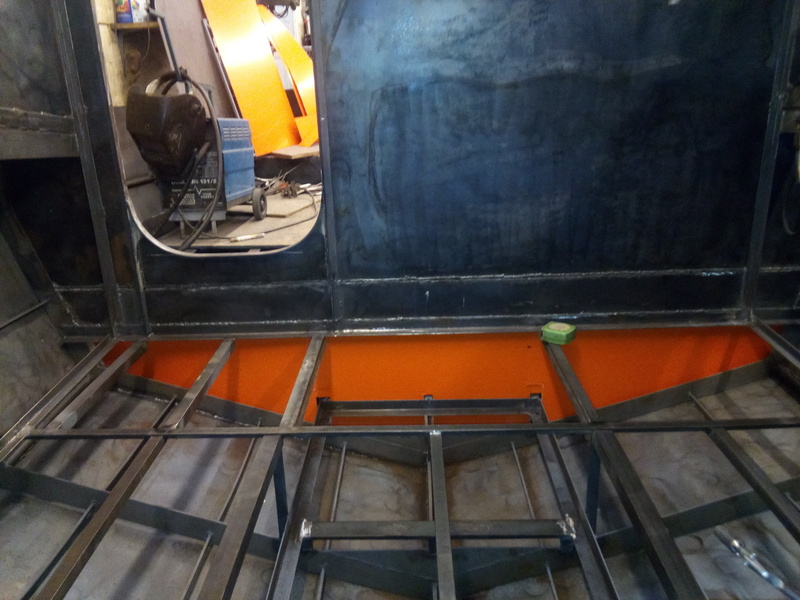 Adding anchor strip for attaching ceiling. Starboard side skin in place and marked for welding. As you can see from this one of the side skins, the spacing of stitches varied depending on the location. 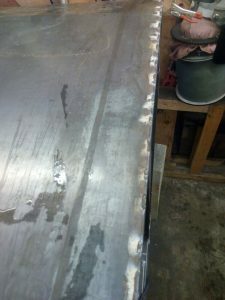 The bottom and front edges were stitched at 1/4” long on 1” spacing. The top was 4” spacing and 1/2” stitches. 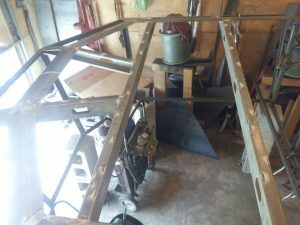 I am still deciding on the budget of what the side windows will be in shape. 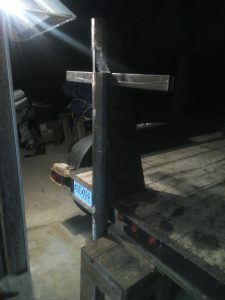 I believe I need cross venting from a couple of small RV, single hung sliders. Bur with all the rains lately, the “money trees” are sprouting wrinkly $3 dollar bills with a previous president’s face on them. Since they are worthless, I am having to spray for disease… sorry bad political joke. 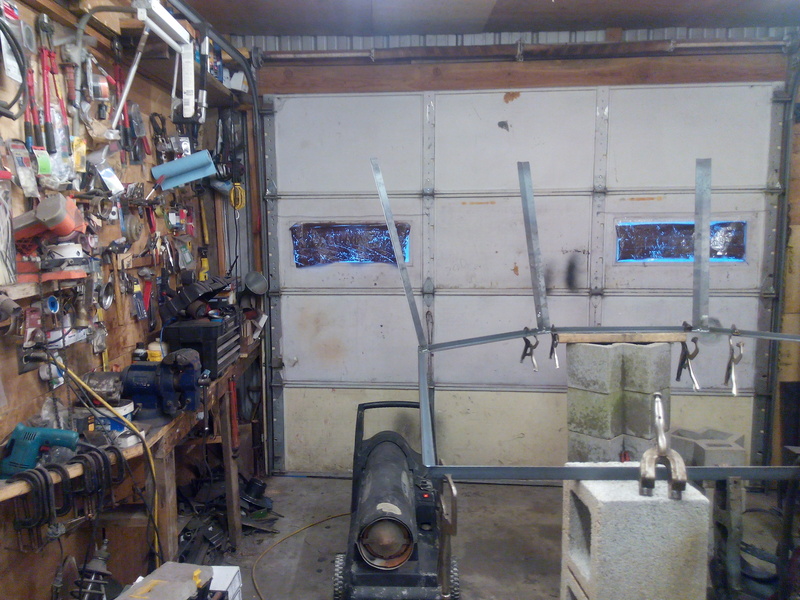 So, I am thinking to cut these 2 side windows in the next couple weeks, after I bring my wife home from Idaho. She is “retiring” from her job there, to help me with the farm here in SW Missouri. (no joke). 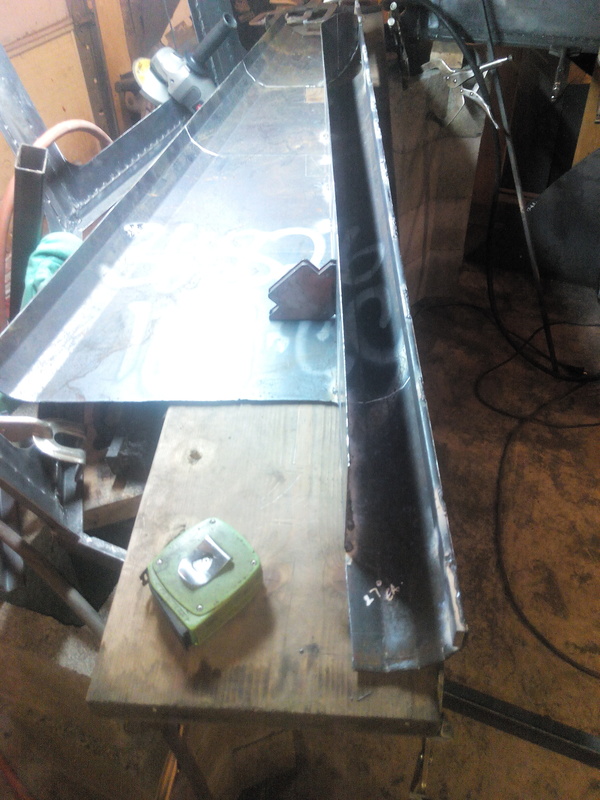 I did some figuring and designing, and after cutting the 2 side skins, I had enough to start the Mast/Stack. This idea takes its design from a couple larger tugs I have seen, as well as a couple cruise ships that use the idea. 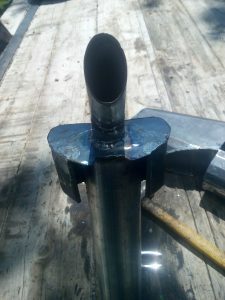 My thought was that as much as I like the “macho look” of vented and chrome tipped stacks, on this little boat, they may be a source for a burn or equipment damage. And I had to waste valuable interior room to enclose them. 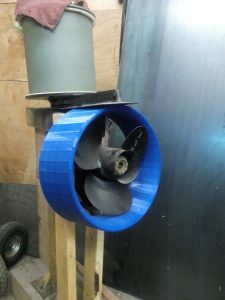 But you are saying, “I thought this was an electric tug…” And you are right, it is. But to be able to have the option to commute on farther away jobs, I decided to add a small diesel generator below the aft main deck, just behind the aft bulkhead of the wheelhouse. I have thought for a while, that I wanted it to have the “Hybrid” option. This makes it so that the aft battery bank is only 8 batteries. I feel this is a reasonable trade-off for the range extension and overnight recharge or camp-out capability. I have found several candidates, but will address this later. 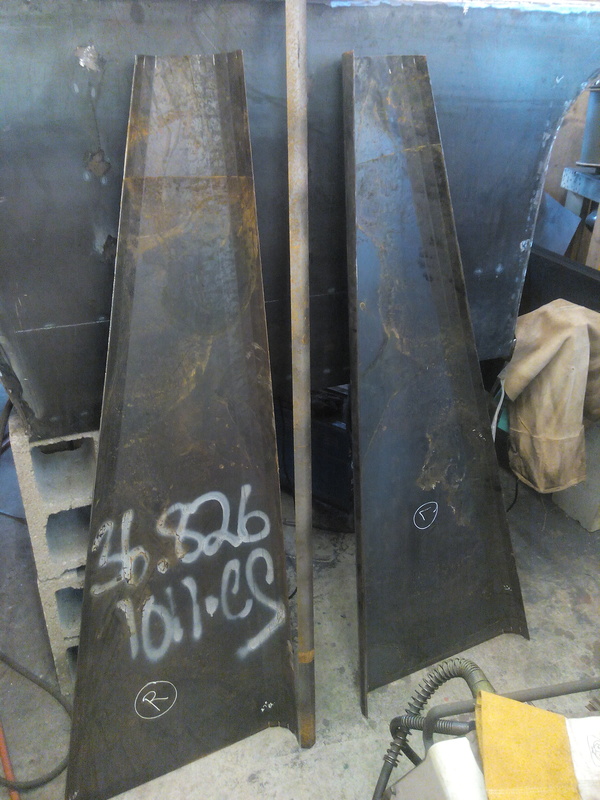 Mast/stack halves broke and ready for final fitting and assembly. When the pieces were back, I installed the spreader that also serves as the exhaust muffler containment. Installing the spreader in the stack/mast. I made a half-template for the baffles that would hold the homemade muffler in place. 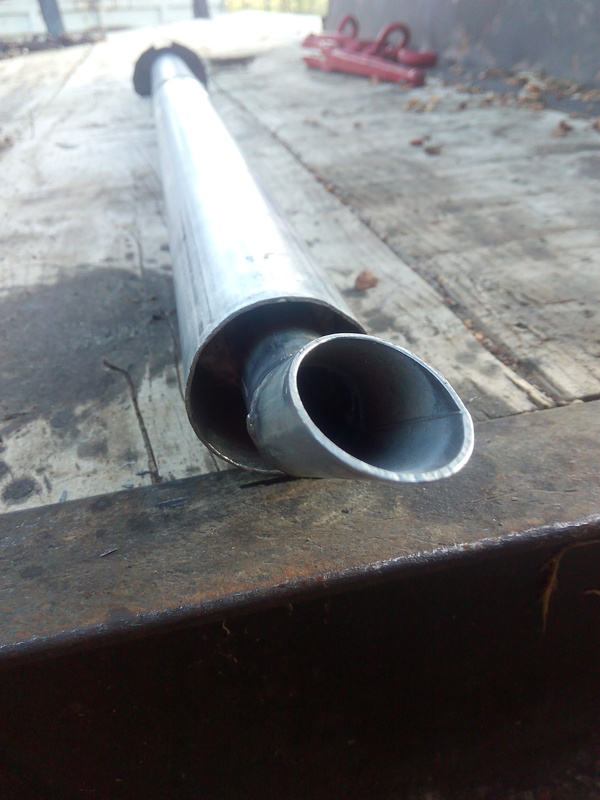 I took a piece of 1” EMT to make the main muffler pipe. 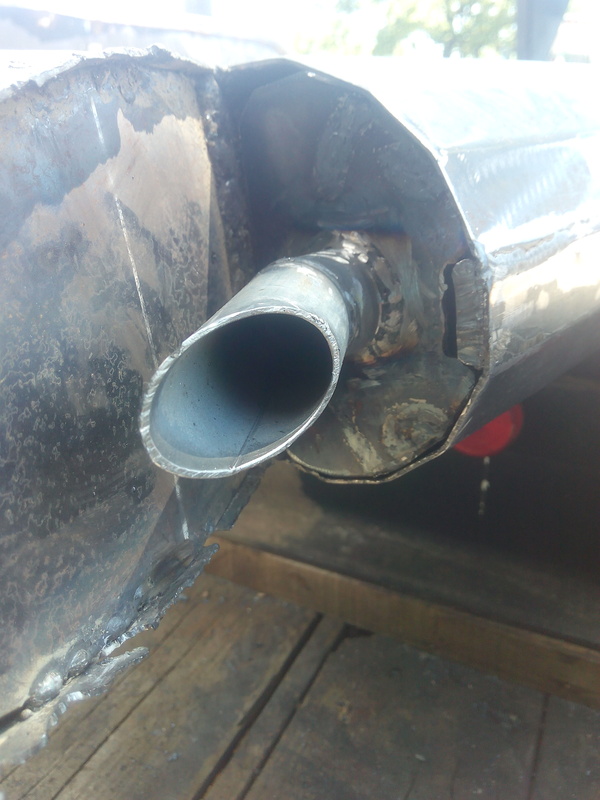 since this is slightly bigger than the factory exhaust for my little Yanmar. I cut a couple places, one for the center baffle in the glass-packed area, and the other near the top for the aft facing tip. After drilling 84 – 1/8” holes in each side of the baffle, (74 combined holes equaled the area of the 1” EMT), I wrapped it with a 3 1/2” batt of the pink stuff and covered it with metal screen for installation. 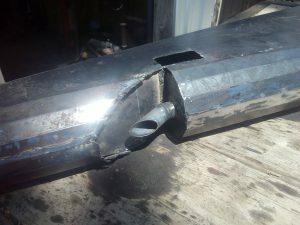 I then slid it into a larger pair of 2 1/4” straight auto exhaust extensions I had welded with the swelled part in the middle. (It has to do with pressures and resonance.) I then capped the ends, welding the baffle plates to both the inner and outer pipes with absolutely no leaks in the welds. 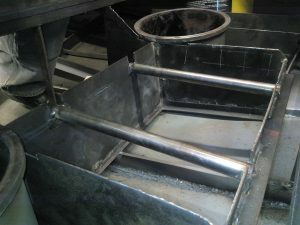 Glass-pack in place before welding end caps. I then added a 1/4” x 1” flat-bar up the back, and a 2” matching broke piece for a weld stiffener in the front. I have the sneaky suspicion that this will be well used in attaching an actual mast pole for a boom and rigging after it is all done. Leading and trailing edge stiffeners being welded in. 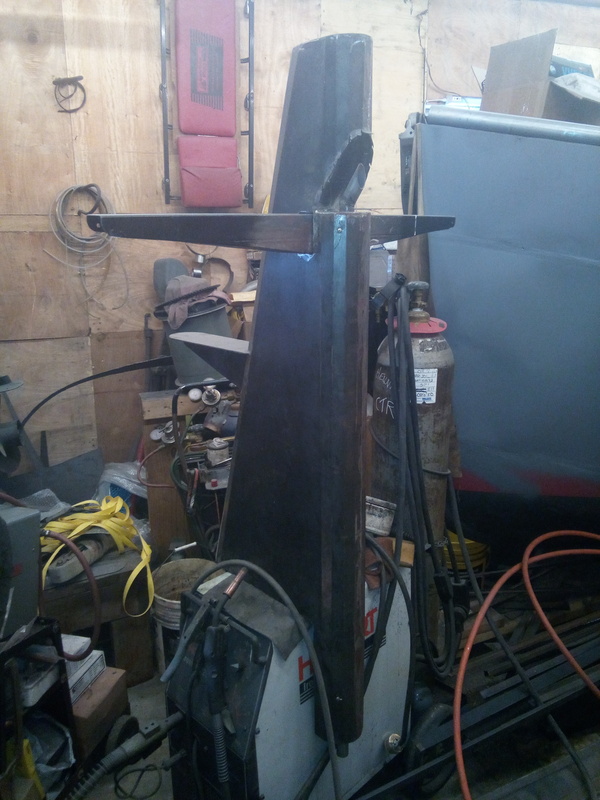 What looks like a conning tower will be my mast/stack. Like I said it was late and I said, “wait a minute, I ain’t building a submarine!” “This has to be fixed…” and went to bed. Next day, I went back to finishing the custom glass-pack and contemplated the look. Here I added oversized angles for mounting the muffler in the mast/stack. Adding mounting angles to the end caps. 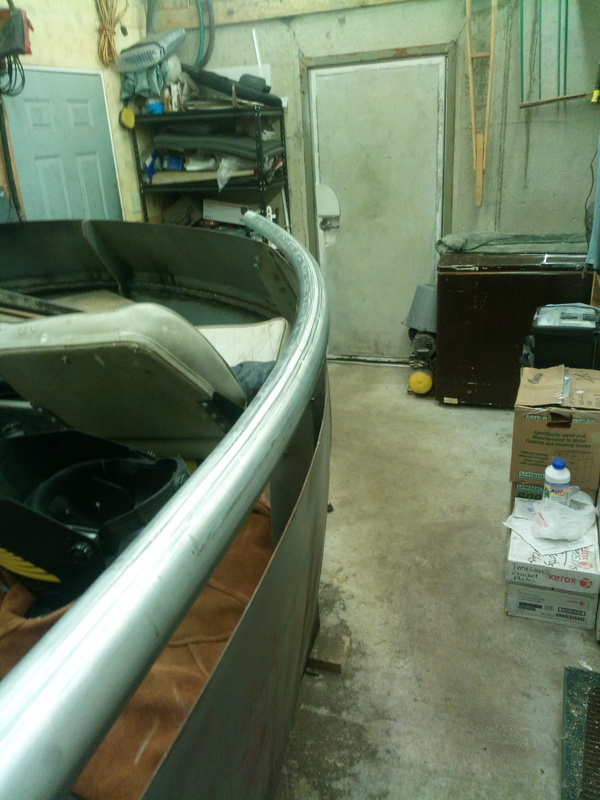 Once installed on the boat, it will get a liberal coat of hi-temp silicon to seal from the weather, but still be able to cut it loose in a few years when the muffler needs replacing. dry fit of exhaust stack in mast. The exhaust port near the top of the aft of the stack will get dressing, and shed strips to reduce the amount of rain or lake getting in. 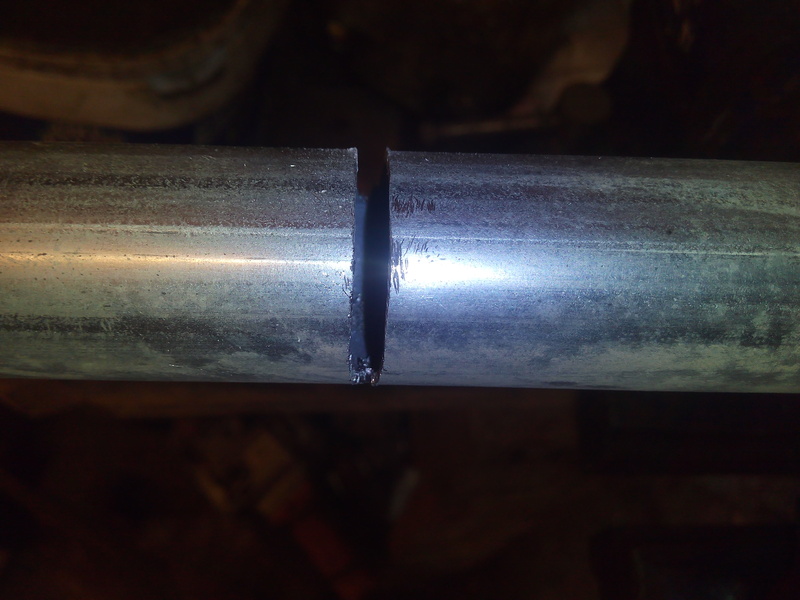 I cut out the small piece that covered the end as it was now not needed for alignment anymore. 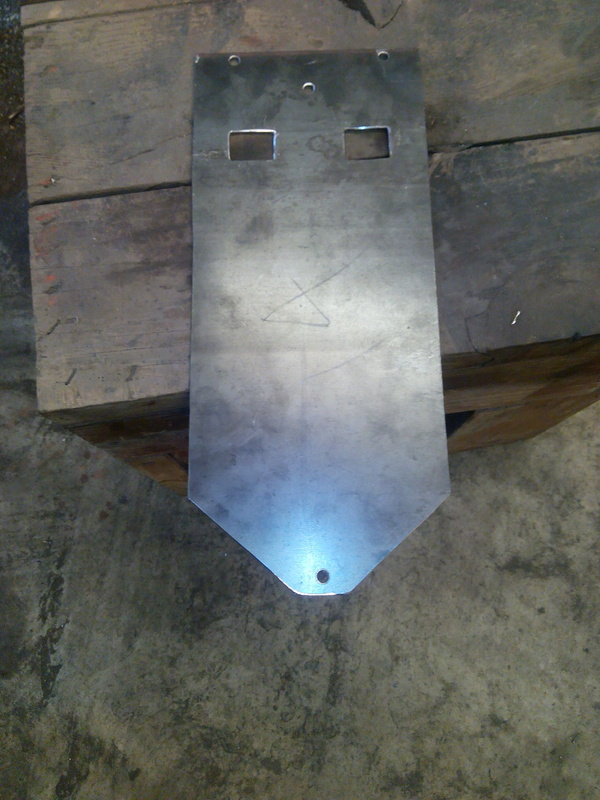 Ready for drilling and tapping of attachment holes. Masthead cap welded and finish-ground. Although not finished yet, I tapered the profiles of the yard arm and it seems to look a bit better. Greetings again all. Since last May, there has been a bunch happen, mostly family and farm stuff. But there was a bit done on the Goliath build too. I have had several call to see if I had given up on the project. And the short answer is,… a resounding NO! 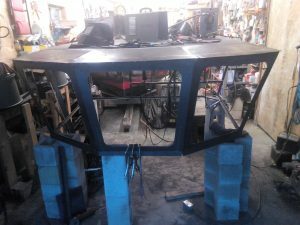 As for the mast and yardarm, I got it mostly all finished and was ready to install the yardarm permanently in the mast, when all dealings with an overseas genset contractor broke down. The single diesel genset idea had to be scrapped, since I could not find an American vendor to make what I needed. 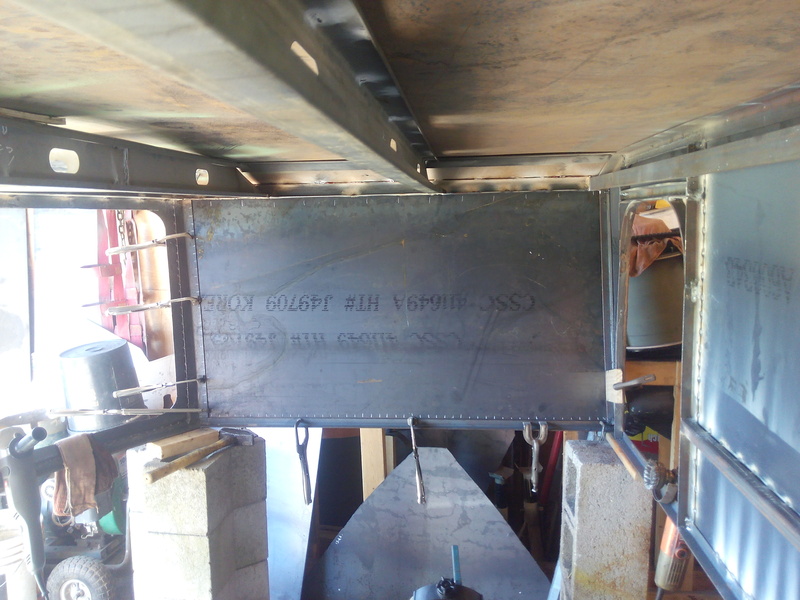 Rear quartering view before removing muffler in mast. I went looking for another supplier, but they are almost non-existent. The “big guys” are too busy making stuff they can sell to the masses for high profits. I don’t blame them, … much. That is free enterprise. The “little guys”, do not have the tech or experience in specialty stuff and so it scares them. I have found a couple of alternatives, and will give more on that once I have secured products. But in the search, I have stumbled upon a concept that I had only dreamed about and never thought I would be able to either afford or make fit in the spaces below decks. More on this later. 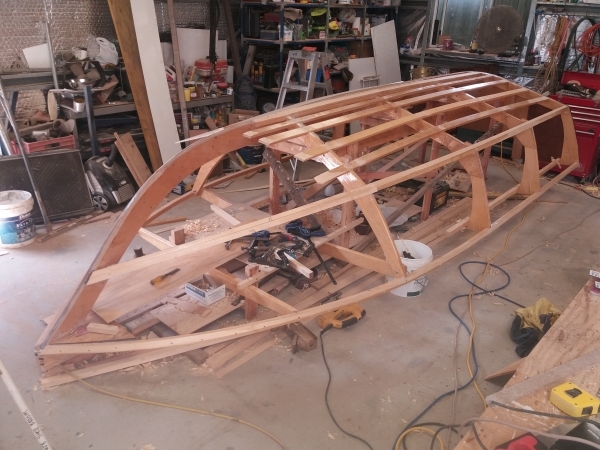 Port Bow top rail ready for final fitting. Port side stern top rail, almost to shape. 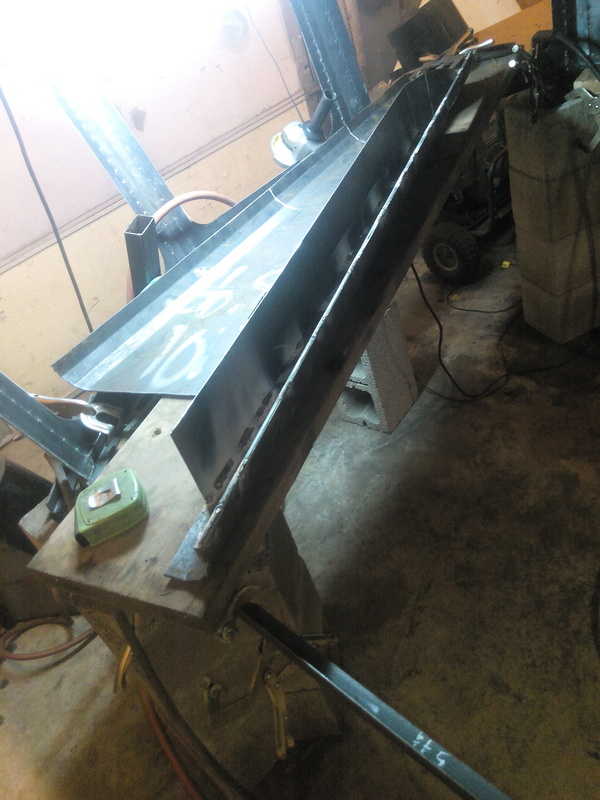 After successfully getting the front rail shaped, I started on the back. 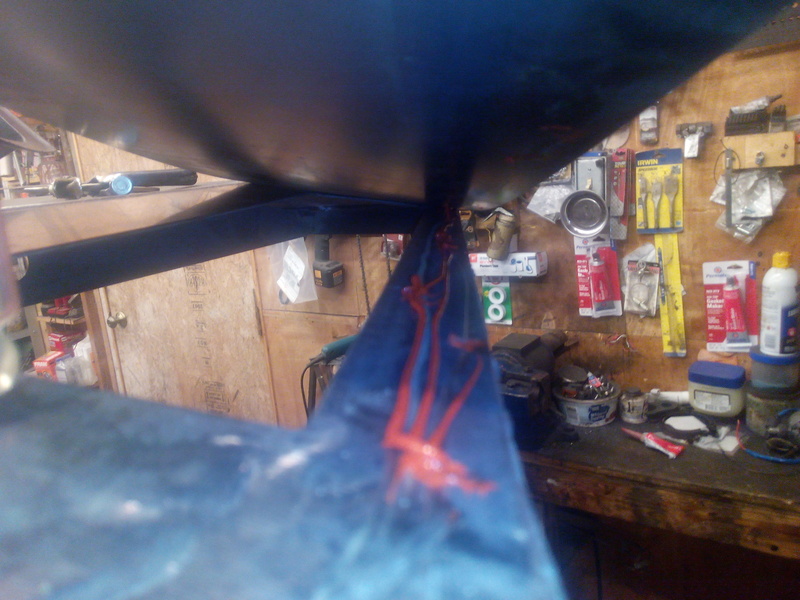 This time, I started at the aft, but kept an eye on the mating fit at the amidships. 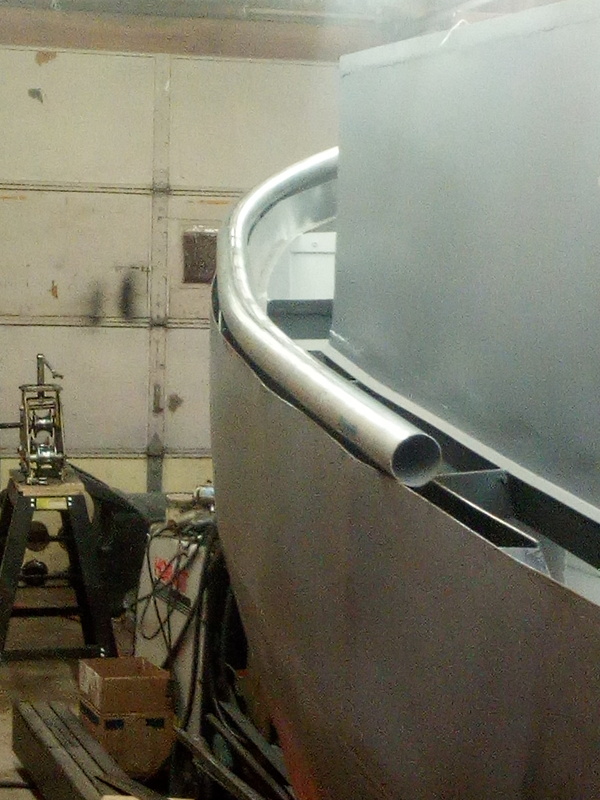 I found that the fantail will get its own center section, to make the curve smoother and look continuous. 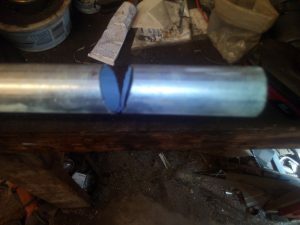 I took a scrap of an end, cut out a small sliver, and made a mating sleeve to connect inside the two side pieces. I only got one side done before I had to stop and get to my farm for a few months. 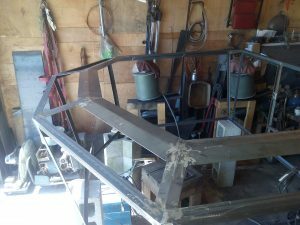 In a spare moment here or there, I was able to complete the construction of the metal work on the wheelhouse top, and primed it. It is still outside the front of my shop, waiting to be painted and then windows and interior put in. 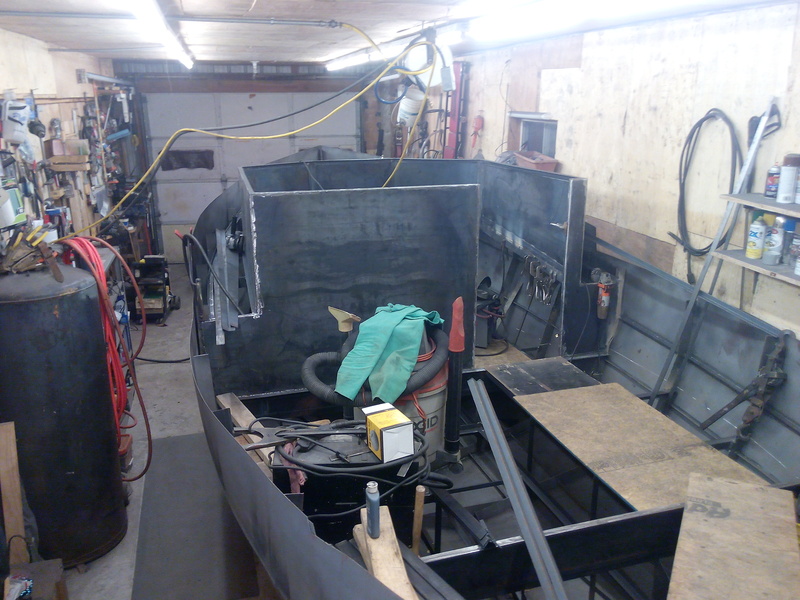 Wheelhouse upper waiting for warmer weather to paint & finish. 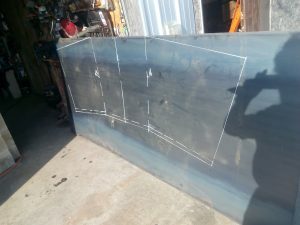 Although it might be a “no-brainer” for most folks, I would suggest you start collecting the instruments and assorted gear you plan on installing in the wheelhouse, the day you start cutting steel. That is what I did in my spare time all Summer. I realized that if I did not want this to look like an old, seventh-owner jeep, I needed to plan the gauge layout BEFORE cutting holes. 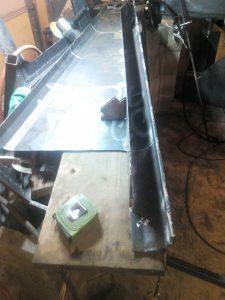 Starboard console – switches and Plotter. I may have mentioned that I had made some arrangements with a very prominent vendor for a “glass cockpit” layout. That was my dream choice. However, after initial contact, visits to my shop, etc, they dropped the ball with me, failing to return ANY of my calls, email, and texts. So I had to fall back to Plan B. I scrambled to secure the right gauges that would fit and work in the tug. Because of industry convention, I am now faced with 3 different voltage systems to meet the mission. 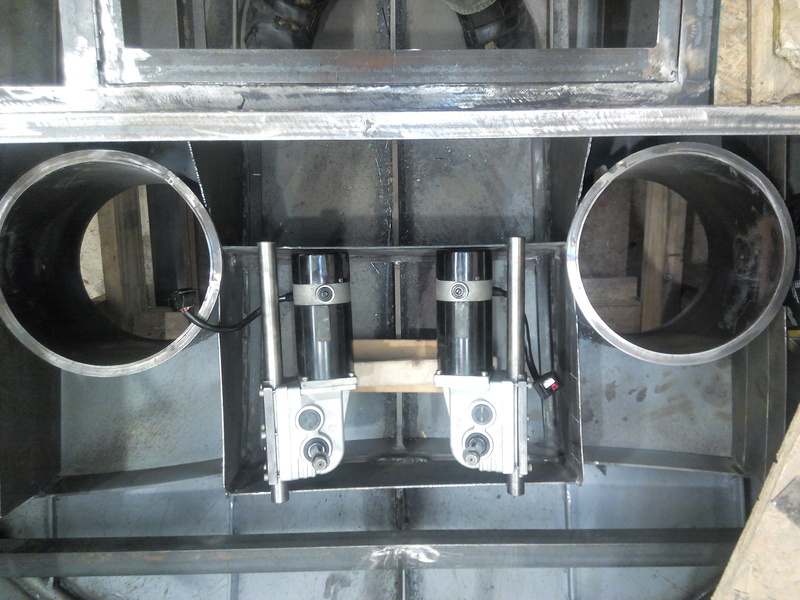 There is 12 volt wheelhouse power. That is lighting, search lights, Nav/Coms, some instruments, instrument lighting, and possibly the A/C, (if that deal works out.) There is the 24 volt systems to cover the powered steering, steering controller, and a few specialty gauges. 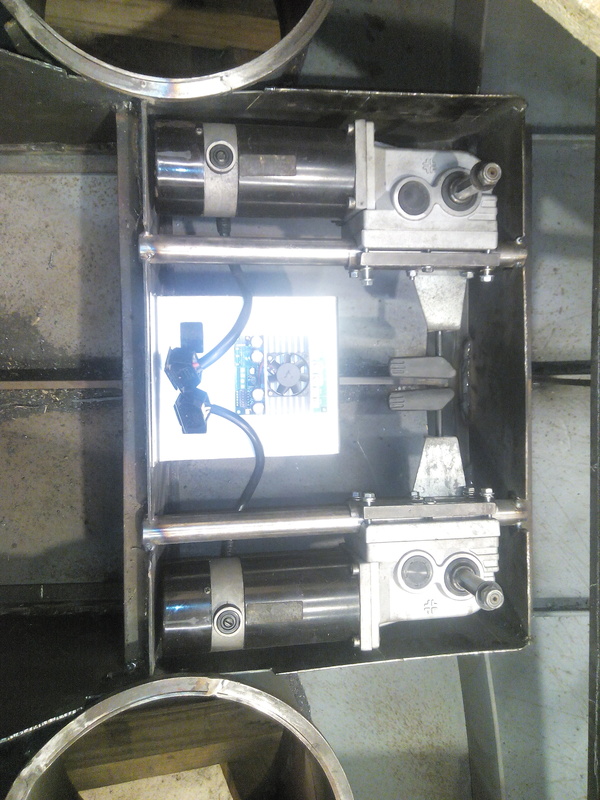 And finally, there is the 48 volt primary drive system. That includes the drive motors, and controllers, and dual/dual charging systems. One of the pair of chargers is onboard charging of the extender gensets, and the other pair is for shore power charging. As of this weekend, the 14th, I was able to solidify a design for the dash console panels, and paint out the wheelhouse. 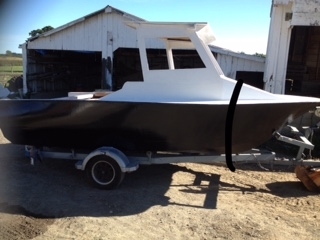 It got a heavy coat of marine type “Mare Island Grey” (50% solids), and I decided to cut a corner on the first coat of color. 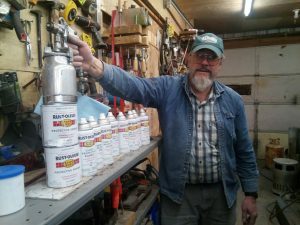 I thought I was “slumming it” and went to Walmart for a dozen “bug-bombs” of Rust-oleum, and 2 quarts of their bulk white. 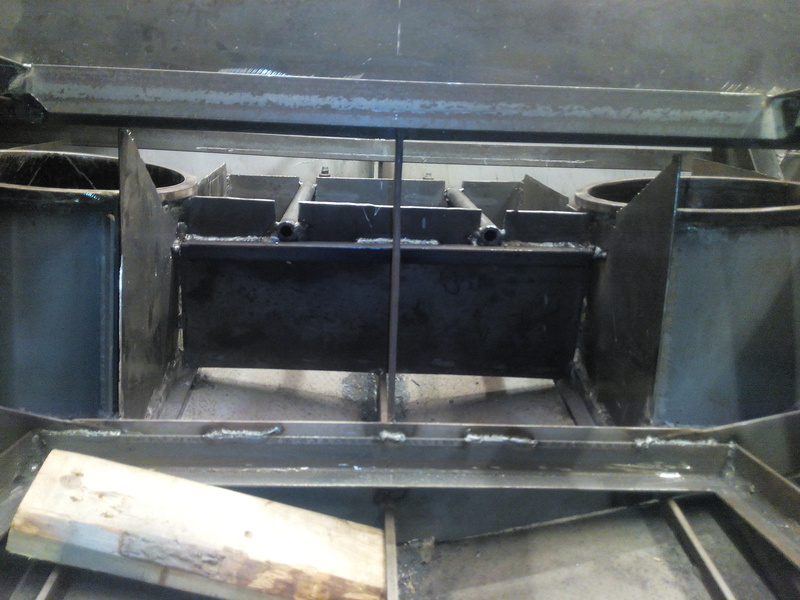 After applying the grey and waiting the 20 hour set-time, I went to work with the rattle cans, shooting all the undersides and hard-to-reach places. There is a lot of waste here, and my commercial gun simply would not reach all these places. And, a pressure pot was out of the financial question. Took all this for just the wheelhouse interior. A word about firewalls here… No matter whether I get diesel or volatile gas powered gensets, I want to minimize the possibility of a below-decks explosion. 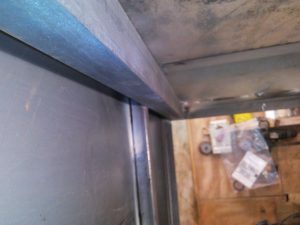 And because I am having to install USCG approved ventilation systems for the battery banks, I chose to divide the two banks with a firewall. (The venting system will be discussed much later.) It is 20 gauge aluminium sheeting I had left over from another farm project this Summer. Here is a preliminary picture of the cut panels prior to installing the fore and aft electrical raceway. The raceway will get a heavy wad of foam rubber at the firewall, just before launching. Hey Chris, This is as close to social media as I will ever get… So no response on twitchy/face or any of that other stuff. As for the media used in the sandblasting process, I finally got around to contacting the Blaster. He said it was “40/80 quarts, shot to a white metal surface, and a 1/2 – 1 Mil matt finish.” He also related that unlike some others, he never re-uses his sand tailings. He always uses fresh sand each job. 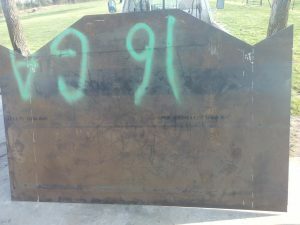 If you were in the SW Missouri area, he is the best priced and always willing to look at the job. A really great contractor. 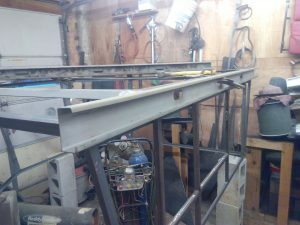 I have the Goliath plans and will be building in aluminum. I’m a retired computer repair tec. ( USN 22 years). 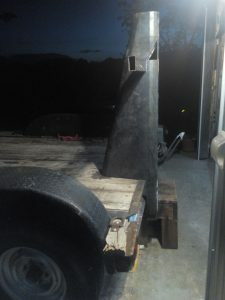 I’ve got a Lincoln MIG 180 Welder (220 volt). The building form is complete and ready to go. 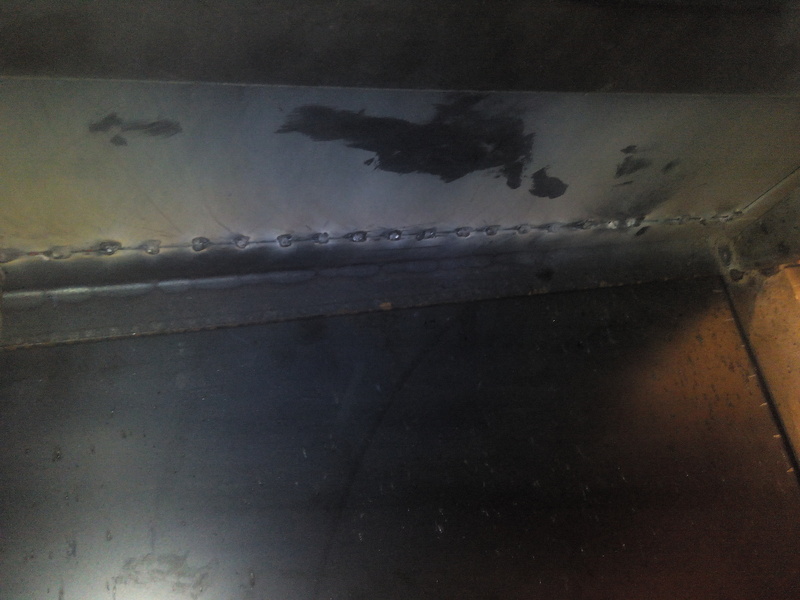 I tried the welder and it would not burn the aluminum, so off to the service center in Orlando. Brand new and broke. Can hardly wait to really get started. I’ve bought the alum. for all the frames and stiffeners. 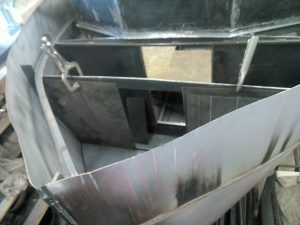 Ed make sure you have GREAT ventilation doing aluminum otherwise you won’t be able to enjoy your end result.